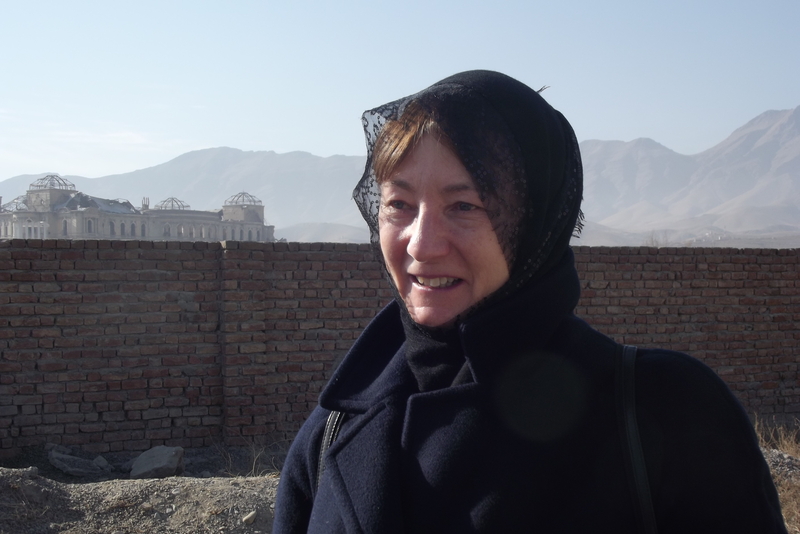 With Voices for Creative Nonviolence UK, I have had the opportunity to practise peace education in Afghanistan for a few days. 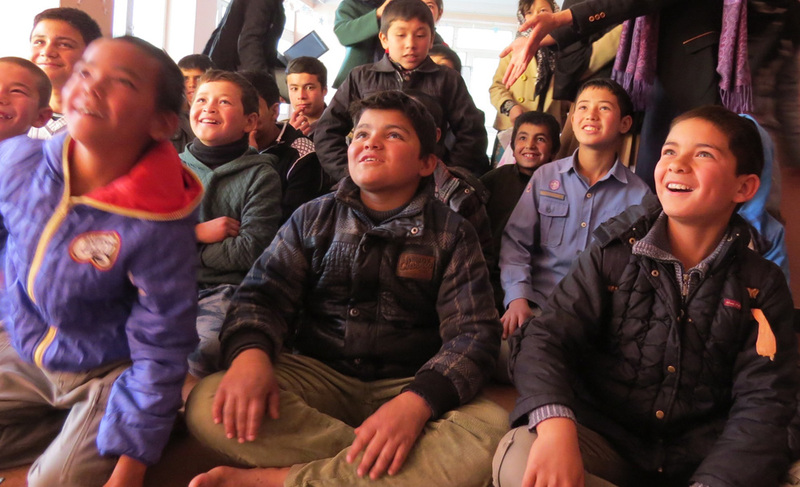 We are delivering workshops in conflict resolution and mediation with street children, and some ‘train the trainer’ sessions with Afghan Peace Volunteers. The APV have a team of nine young men and women who are coordinating work on conflict resolution. 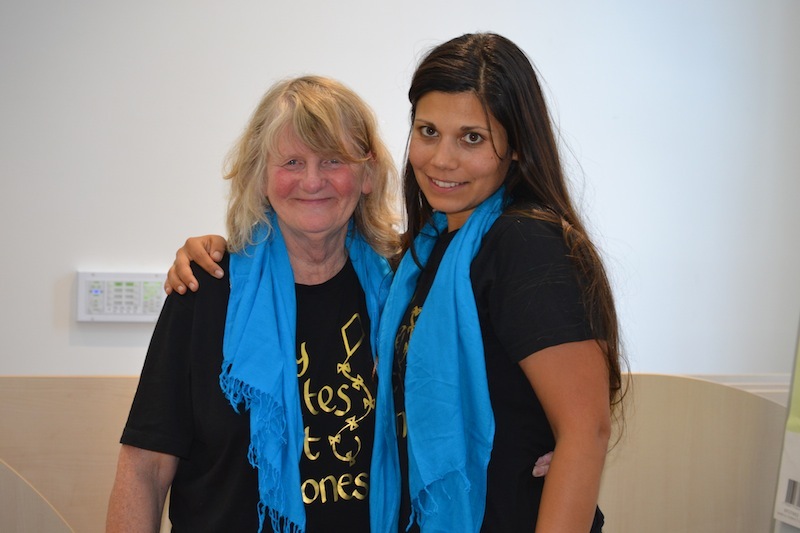 The great thing about doing peace education with children and young people is that it comes naturally, no matter where you are. Young people get the need for fairness, the need to be heard, the need for justice. That said, there are lots of challenges to doing this work compared with Britain. Translating not just the words but the ideas is not easy. 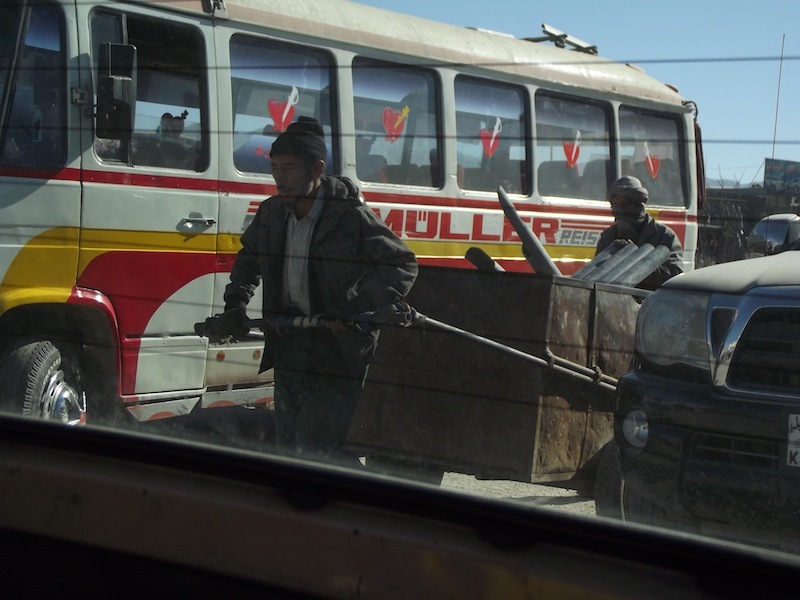 A metaphor I often use is the “conflict escalator”, carrying you up out of control; as far as I can tell there’s only one escalator in Kabul (donated by a penitent of Bin Laden’s family), and the city’s street children are not so familiar with it. Gender norms, family, school and the balance between the individual and the group: all these are different. Moreover, violence is present in homes and the streets. Most if not all of the children we’ve spoken to have witnessed violence, making the idea that conflict and violence are not synonymous, hard to grant. 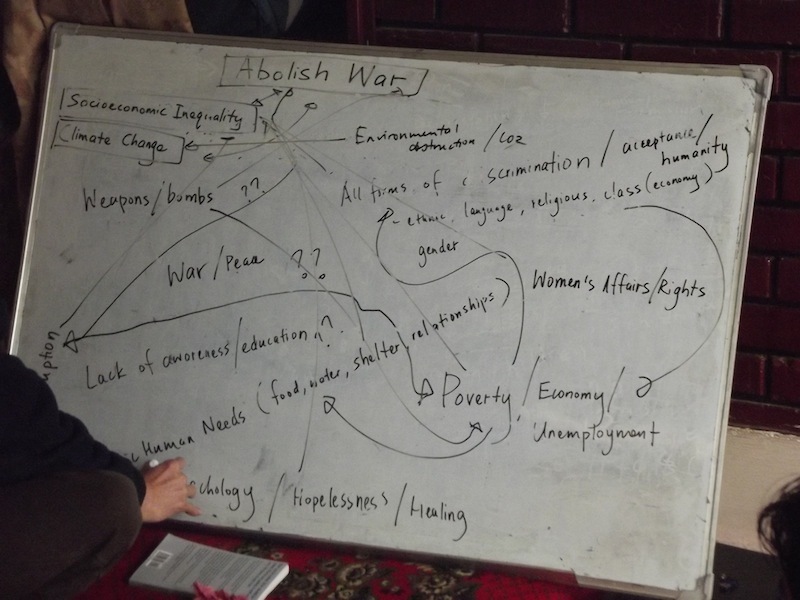 As a teacher, there are concepts and tools I want to convey, but the Afghan Peace Volunteers are teaching me about the conflict resolution they already do. 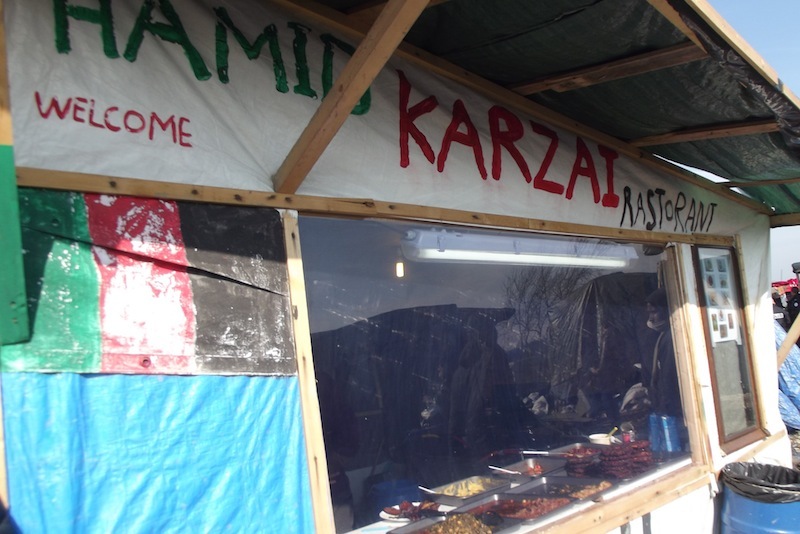 Other Afghans have been surprised at how APV bring together Hazari, Pashtun, Tajik and Uzbeks under one roof. Afghanistan of course has an ancient tradition of conflict resolution, but I suspect Kabul’s young people have innovations of their own. So really, I’m the student. Peace education is already happening here as well. Besides APV, we’ve been in contact with Sanayee Development Centre, the US Institute and Jesuit Relief Services, all of which are reaching young people with different elements of peace education. Ultimately, I will be happy if we have fun together. Solidarity is a big motivation for being here. 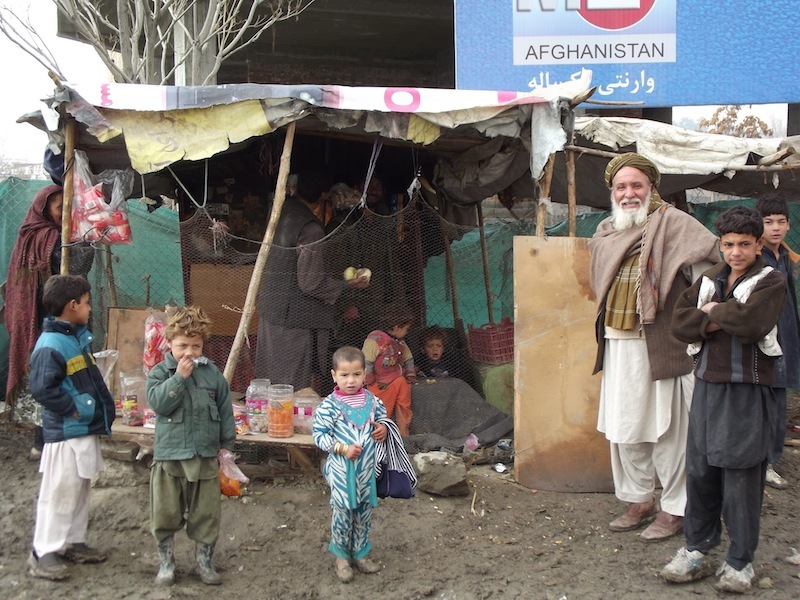 Whatever the intent, many of the interventions by my country and others have made Afghans less safe and less free. But I want to picture Afghanistan as more than the home of drone strikes, illicit poppy cultivation and the marginalization of women. 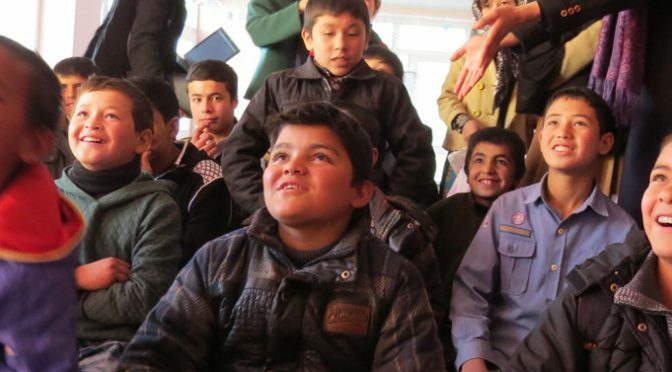 The Afghan Peace Volunteers have taken me beyond these headlines, showing that nonviolence can flourish even when there seems to be no space for it. Conflict is experienced by everyone everywhere, so educating everyone in peaceful conflict resolution is not a “special” intervention that Afghans need more than others; it is a universal right. 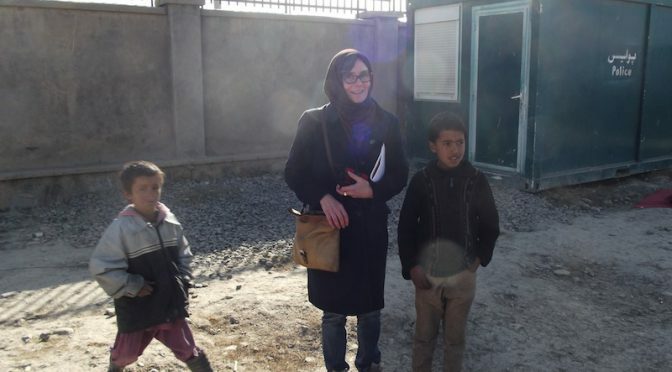 The work of Afghan Peace Volunteers says to the world that they are not giving up on this or any other rights for their young people, and I hope I can stand with them in that. As foreign troops exit Afghanistan and violence across the country rages on, three women peace activists Mary Dobbing, Henrietta Cullinan and Maya Evans have headed to Kabul to spend Christmas with young Afghan peace makers. Afghanistan is still one of the most dangerous countries in the world for women, with little improvements made by the NATO/ US led offensive. Iliteracy, access to medical health, forced marriages, and domestic violence still remain amongst the highest rates of any country today (1), despite British taxpayers funding the war effort to the tune of £37 billion (2). In the last 13 years 453 British soldiers have been killed in Afghanistan, 1,819 American soldiers and tens of thousands of uncounted Afghans, at least 21,000 of which were civilians (4), yet still the Taliban are present in most of the country (5), people can not move safely from one province to another, drones dominate and poverty, illiteracy and violence are rife. 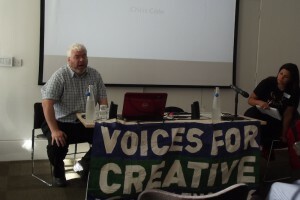 This is an overview of the Afghanistan – The Forgotten War: Britain’s Legacy conference held in London on Saturday 11th October 2014 by Voices for Creative Non-Violence UK (VCNVUK) to mark the thirteenth anniversary of the current war in Afghanistan. British troops will vacate their final base in Helmand, Afghanistan, later this month and 31st December 2014 is the date set for the withdrawal of foreign troops from the NATO/ISAF (International Security Assistance Forces) coalition from the country, effectively signalling the end of the current war. 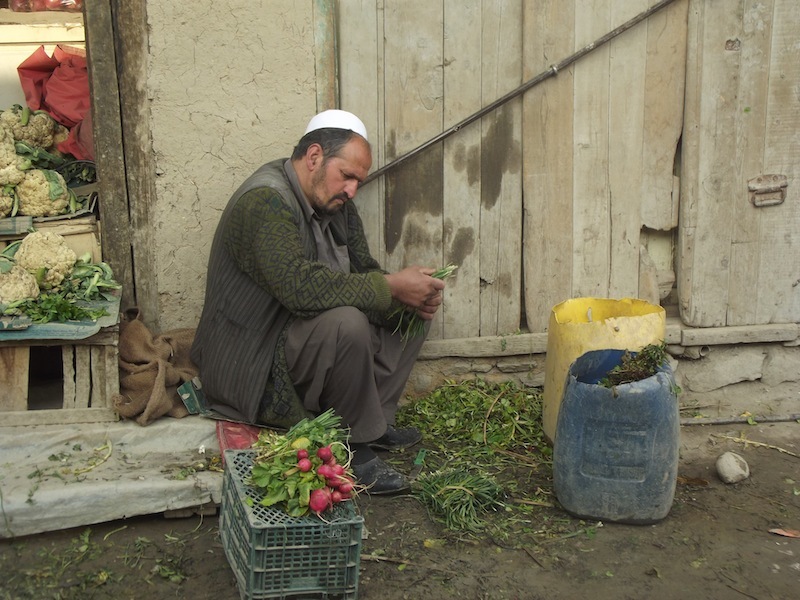 Many Afghans are positive about and look forward to rebuilding their country in the post-conflict period. Having just elected not one but two new leaders, challenges lie ahead for both the leadership and ordinary Afghans. Almost immediately upon the election of the new government, the US and Afghanistan signed a Bilateral Security Agreement (BSA) the previous president had refused to sign, whose terms include the retention of almost 10,000 US soldiers in the country after 2014 to work “on two important security missions: training and equipping Afghan forces and supporting cooperation against terrorism”. A similar agreement was signed with NATO, bringing the total number of foreign troops remaining in the country to around 12,000, 500 of whom will be from the United Kingdom. The withdrawal of foreign soldiers, however, does not signal an end to fighting in the ongoing civil war between different ethnic and religious factions and war lords. With the focus on the US and NATO’s activities in Afghanistan, this war has been underreported in the international media. The impact of the war on all parties will continue for many decades and in many ways. David Cameron’s visit to Afghanistan as the first foreign leader to meet new president Ashraf Ghani reflects this. While there, he reiterated the old fallacy that troops on the ground there prevented terrorist attacks here. With the conference falling at the end of the annual Drones Week of Action (4-11 October) and the planned final withdrawal this month, the focus was very much on Britain’s military legacy and ongoing covert engagement in Afghanistan. The conference was hosted and introduced by Maya Evans from VCNCUK. Around 50 people attended. Andy Garrity from the Toxic Remnants of War (TRW) project, which looks at the detrimental impact of military activities and materials on the environment and human health, spoke about the consequences of the NATO drawdown and the toxic environmental legacy of the war. In the process of withdrawal, over 1200 bases will either be closed or handed over to the Afghan authorities. The BSA negotiated at the end of September does not provide adequate rules on how bases are to be dismantled or decommissioned in an environmentally and human health-friendly way. Although the 2014 Status of Forces Agreement (SOFA) complies with Afghan legislation, the level of environmental protection offered is relatively low and there is no guarantee of enforcement by any of the parties. There are many sources of environmental and health risks and pollution. Practice firing ranges, used to train soldiers, are usually abandoned due to the cost of clean-up and the lack of legislation making it mandatory. Residues and unexploded munitions stay behind. While the US says that it could take up to 5 years and $250 million to clean up such ranges, there has been no discussion on actually doing this. According to the UN, children are at greatest risk from unexploded ordnances (UXOs): explosive weapons that did not explode at the time they were used and can still be detonated decades later. This is due to children, in particular, scavenging for scrap metal among the discarded materials to sell to earn money for their families. In addition to the risk of explosions, they are also exposed to carcinogens and UXO contamination. Other risks are posed by MRAP (mine-resistant ambush protected) vehicles designed to withstand IEDs (improvised explosive devices) which are often simply abandoned. The cost of returning MRAPs to the US is estimated at $500 million where they would be of no use. These vehicles contain harmful carcinogenic materials, including cadmium, chromium and lead. Before abandoning bases, many materials are disabled for “security” purposes, such as computers, fans, turbines, etc. and are of no further practical use. This scrap waste is sometimes abandoned on roadsides and poses risks to children playing and rummaging for metals to sell. Other waste from bases is consigned to burn pits, including aviation fuel, chemicals and clothing. This takes place at most bases and emits low-level pollution. Local residents have complained of increasing rates of asthma and respiratory problems. US army veterans have complained about higher rates and risks of cancer. While some compensation has been paid to veterans, following campaigns, the US maintains there is no risk of harm and admits no liability. No civilian health studies have been carried to assess the risk to Afghans or possible compensation owed to them. While NATO and ISAF troops already adhere to low levels of environmental protection, drawdown has meant their replacement by private military contractors, who often overlook existing regulations and are not subject to public scrutiny. Currently outnumbering foreign soldiers two to one, their use is likely to increase further and their actions lack transparency, posing a concern for the future. The total cost of clean-up has been estimated at $5.7 billion by the US. TRW believes that NATO and ISAF must be held accountable for environmental damage and damage to public health. In addition, military and security agreements must include more strongly-worded environmental protection. Seeking accountability, however, is hindered by the fact that this could set a precedent for conflicts elsewhere and claims for compensation and clean-up. Dangerous in the longer term, the focus is only on avoiding the cost of cleaning up right now. 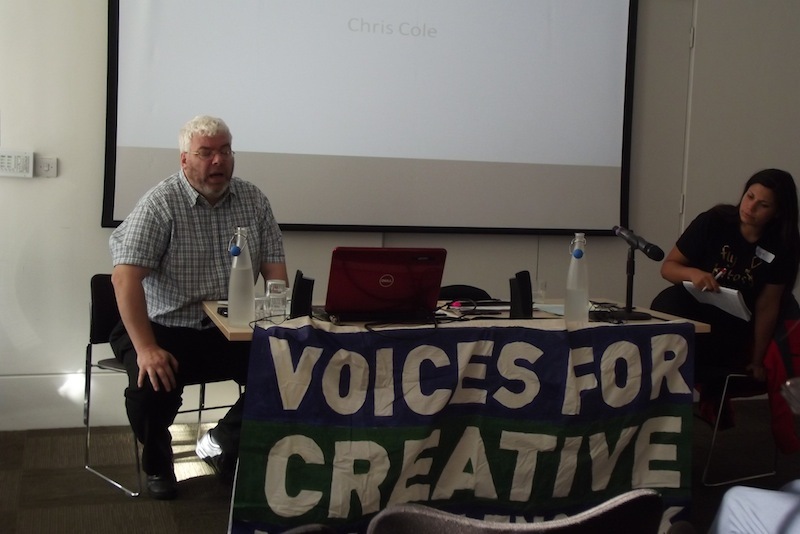 Chris Cole from Drone Wars UK talked about the UK’s ongoing military involvement in remote control drone warfare in Afghanistan. Due to the secrecy surrounding operations, there is no data available to provide accurate statistics on strikes and casualties in Afghanistan; however, more drone strikes take place in Afghanistan than anywhere else. Cole called drones the “new form of warfare”, with remote control strikes being launched against targets from thousands of miles away. The UK started using military drones in December 2004 along with the US as part of a joint taskforce in Iraq. Using its own MQ-9 Reaper drones, Britain has since become addicted to drone warfare; in spite of the drawdown of troops over the past few years, the number of drone strikes has multiplied. Britain has spent over two billion pounds on buying and developing drones. In 2014 alone, over £100 million has been committed to drone technology development. Drones do, however, have certain advantages. With the war in Afghanistan longer than World Wars I and II combined, and increasing public hostility to war, especially the commitment of troops on the ground, drones offer governments a means of continuing their war games in a manner that bypasses public and media scrutiny: secrecy is a large part of the drone package. In 2009/2010, almost half of all air strikes were by drones; that number is now over 80%. Virtually nothing is known about the impact on the ground. Following an investigation by the LA Times in 2010, only one incident in Uruzgan province, where 23 civilians were killed, including children, prompted a military investigation leading to compensation for the families. There were no prosecutions. Patchy media coverage is available; on the day of the conference, two people were reported to have been killed in a US drone strike near the Pakistan border. An important point raised is that the secrecy surrounding the use of military drones is closely linked to a wide network of intelligences bases around the world, such as those revealed in Edward Snowden’s leaks about the activity of the US National Security Agency (NSA). With an increasing number of bases being used all over the world, the surveillance society and intelligence-gathering aspects of drones must not be overlooked. With an ongoing UN inquiry into the impact of drone warfare on civilians, it is clear that it offers no solution to global security problems. Former military officer, barrister and author of Investment in Blood: the True Cost of Britain’s Afghan War, Frank Ledwidge spoke about the cost of the war. The war has had a human cost for both the UK and Afghanistan; 453 British soldiers have been killed and more than 2500 injured, more than 600 seriously. Once they leave the military, they are only entitled to civilian support on the National Health Service (NHS), and not any special support, as is claimed. Although the remaining British army in Helmand have not been engaged in combat for most of 2014, the impact of their presence on the almost two million residents of the province is almost entirely unknown. For most people in Helmand, however, the war is far from over with heavy fighting between local groups. While even NATO has recognised that most so-called Taliban are in fact local residents, as compared to the smaller contingent of asli (original) Taliban who ran the country before the war, many engaged in the current fighting are local people in gangs, drug dealers, war lords, etc. An area now better known for its production of almost half the world’s opium harvest in 2013, at the time, the British army gave this rural area importance on the pretext of preventing domestic terrorism by placing troops on the ground to defeat the Taliban. In fact, there have been far more civilian casualties, even though official statistics are not broken down. Larger than the number of fatalities is the number of people injured or maimed. At the height of fighting between NATO/ISAF and Afghans in the province in 2010, in one month, one hospital admitted more than 4000 people. Official government statistics have put the military cost of the war in Helmand at £25 billion, but the actual cost is over £35 billion, with fuel as one of the most expensive items. In the longer term, the single greatest cost will be care for veterans and wounded soldiers. Based on estimates for the US by experts there, Ledwidge has estimated a similar veteran care cost for the UK from Afghanistan of around £50 billion. According to US experts, the cost of veteran care peaks 40 years after the conflict. In a freedom of information request made by Ledwidge to the MoD, he was informed that no budget has been set aside for Afghan veterans. There is only a £70 million fund for combat stress. Before concluding the conference and holding a set of afternoon workshops on issues such as Afghan women, drones and the war on terror, Kabul street children, and opportunities to build peace, a short Skype conversation was held with Afghan women in Kabul from the Afghan Peace Volunteers (APV), who work closely with VCNVUK. “Saving Afghan women” was one of the main pretexts for the war. Asked about their views on the new government, some of the women said that it was too early to tell but that people were still optimistic; others said they were not optimistic as the current government included politicians who were involved in various wars over the past three decades. One woman there would be no real change until the style of leadership changes, eradicating nepotism and the culture of self-serving war lords who have no interest in the concerns of ordinary people. Asked their views about the retention of thousands of foreign soldiers in the country, all of the women were against this as soldiers and military strategies have failed to bring about peace. Asked about the effects of war on women, one said a major impact was the loss of their husbands and children. 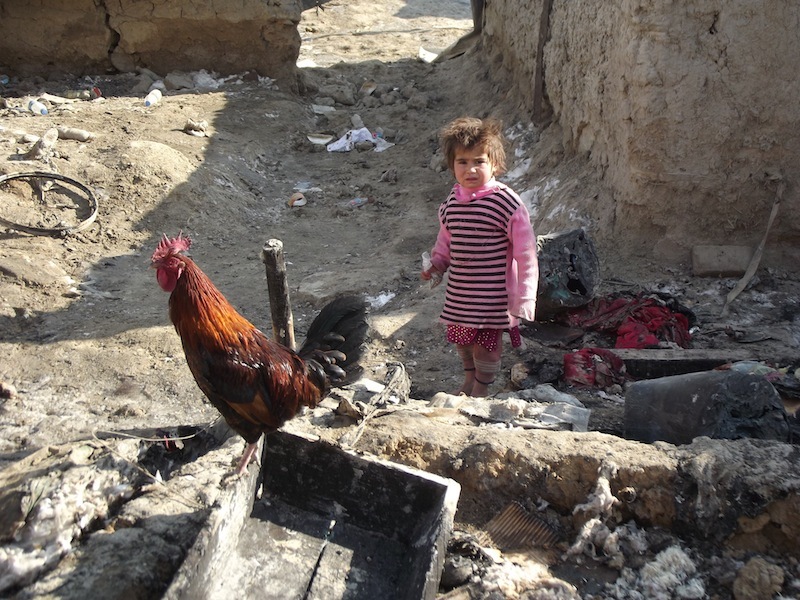 In 2013, most casualties in Afghanistan were children. They also spoke about being psychologically traumatised, making many afraid to leave their homes. With the focus on staying alive, support for families and building families and communities takes secondary importance. With thirteen years of war focused on combat and not people, one of the major challenges identified by this second annual conference is how to stop Afghanistan falling off the radar completely at the end of this year. The war is not over and media and public lack of awareness and disinterest must not serve as a pretext for further abuses and atrocities. 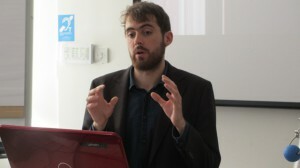 The conference was supported by Drone Campaign Network. They also discussed their thoughts on the upcoming Afghan elections, wished one another Happy Nao Roz and talked about what they were having for dinner! The event attracted media coverage from the Lincolnshire Echo and local BBC. 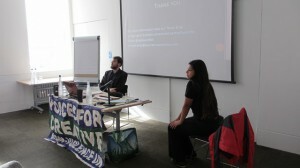 Drone Campaign Network and VCNV UK organized the event. LITTLEHAMPTON: 22 Young Quakers (aged 11-16), and 8 Quaker adults, took part in a short interactive workshop on drones finding out: what they are; discussing concerns; plus reading the stories of a former US drone pilot who was traumatised by his experience; as well as about the Afghan Peace Volunteers’ critical stance on drones. They made around ten homemade kites and took them to the beach. 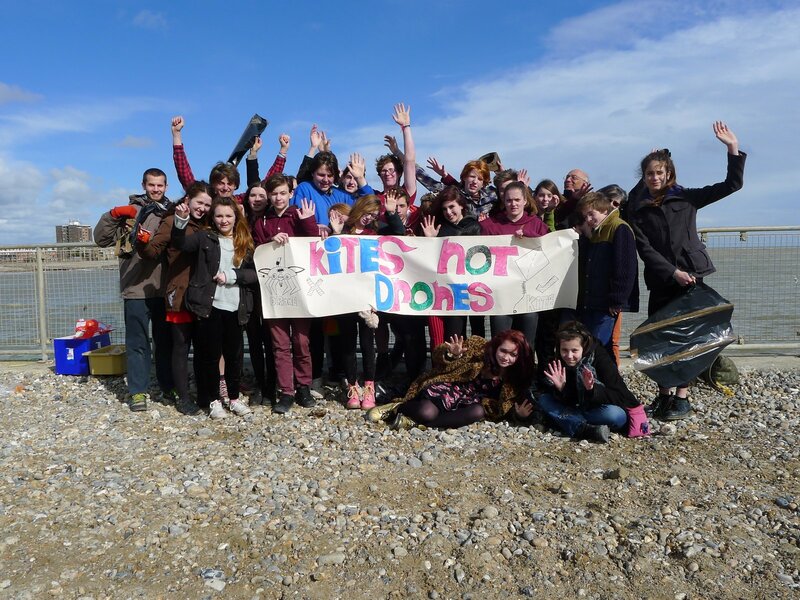 They also made a banner with the message ‘Kites Not Drones’, and some them watched the “excellent short film” of the APVs talking about the Kite Not Drones action. Organized by the Young Quakers. HASTINGS: a pre kite making workshop was held at their local Friends Meeting House where exquisite peace doves and traditional handmade kites were crafted. 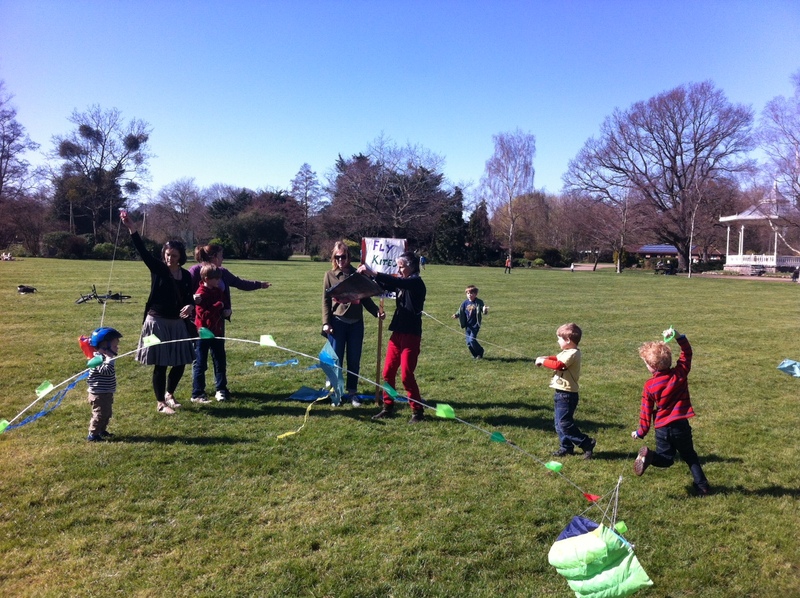 A group of kite runners met on Saturday and Sunday 10am on West Hill during which around 50 people took part in a weekend of kite flying Afghan solidarity. 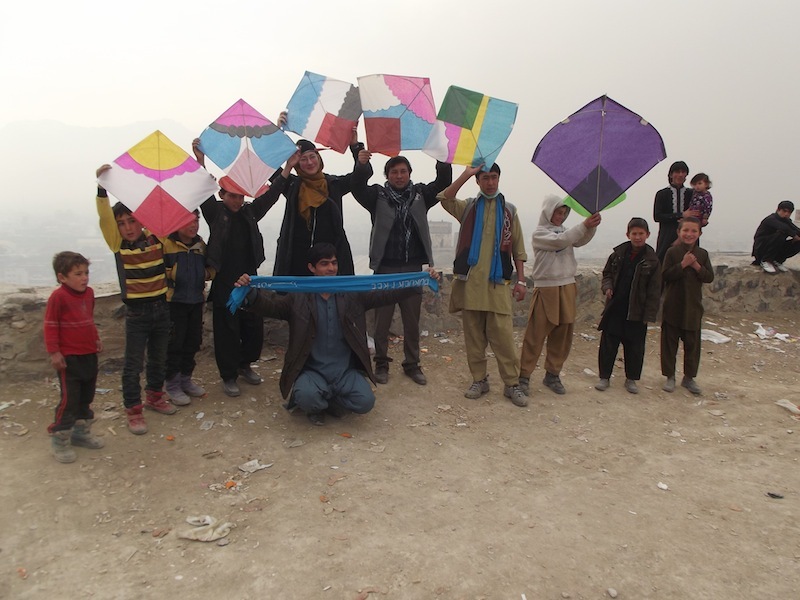 Genuine Afghan kites were flown on a sea breeze- borderfree. 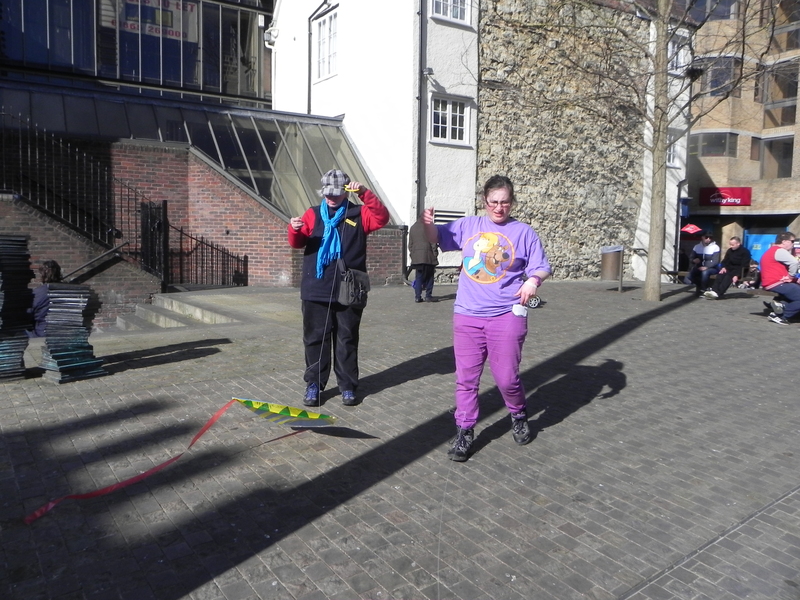 The event received local support from: Woodcraft Folk, Hastings Independent as well as a splash in the Hastings Observer. FKND Hastings was organized by Hastings Against War and VCNV UK. 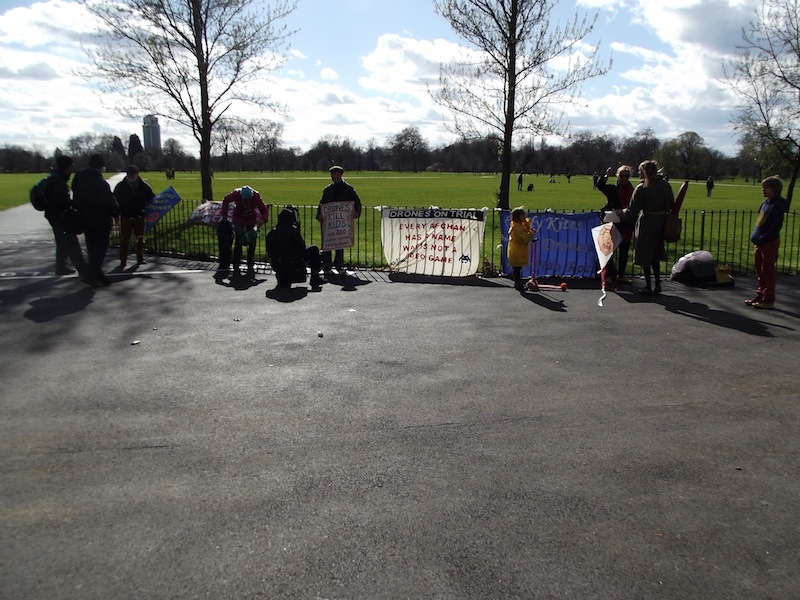 LONDON: Saturday 22nd March saw 10 kite flyers and 4 professional photographers in Hyde Park Speakers Corner at 2pm. 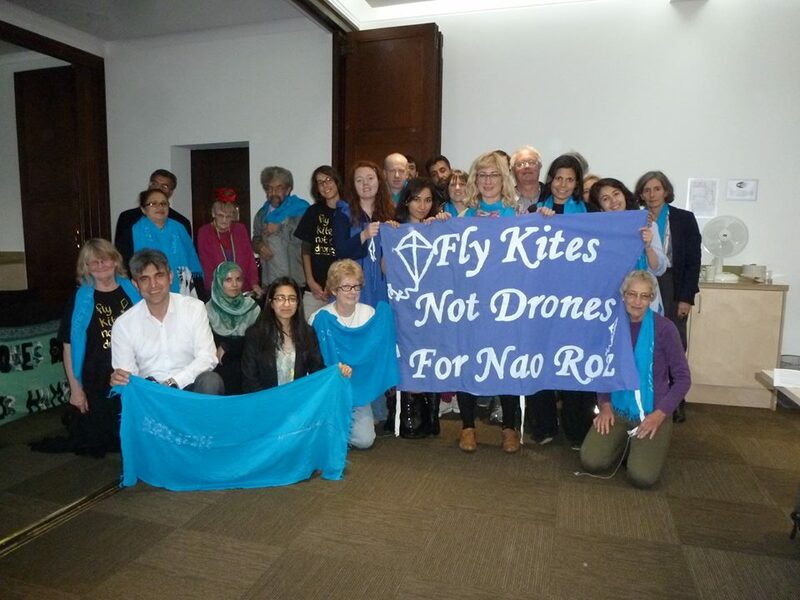 The group which included: The Activettes, Kingston Peace Council and Putney UNA did not comply with the legal process of seeking police permission to hold a kite flying anti drone protest in a Royal Park. 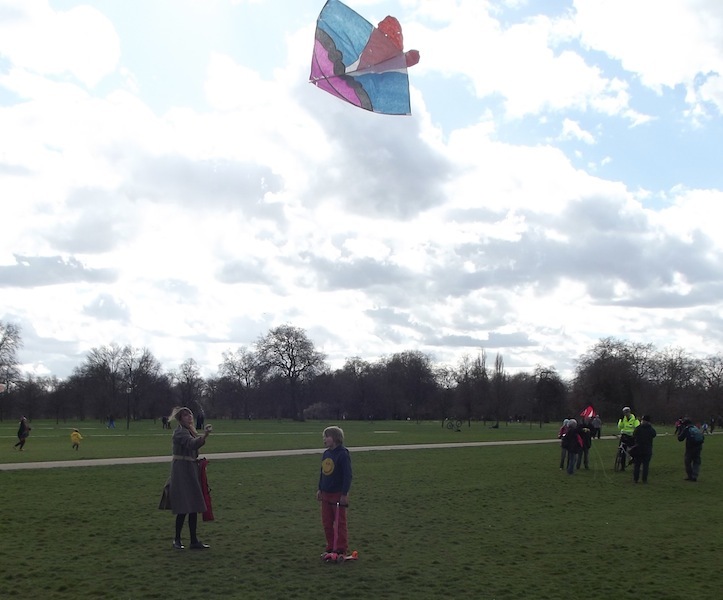 The London Kite runners were adamant they would carry on despite police warnings. Leaflets were given out while banners and placards were visible to those passing-by. The event was organized by The Activettes and VCNV UK. CHICAGO: Saturday afternoon, community members and students met at the Voices house to celebrate Now Roz, the Persian new year, and to participate in the APV call to “Fly Kites, Not Drones.” We crafted our own kites and marched to the lake to fly them. It was a perfect, windy day for kites. On the shore, we spent a moment in silence, mindful of all those victimized by drone warfare: the deceased, their families, the soldiers ordered to kill, and the children who live under fear of surveillance and unexpected attack. Then, we lifted our kites to the wind. Full grown women and men were running around and laughing like children. It was mostly the store bought ones that actually flew. Even still, we giggled and teased trying to get our home-made kites to fly if only for a second. Earlier, my friend Samah showed me videos of the Now Roz celebration in Iraq, where a thousand balloons lit up with candles are released into the air. In the video, the crowd cheered and waved. Samah told me that when people saw this, they cried. In times of surveillance, of fear, it is an act of bravery to gather in public and celebrate. The power of such communal creative acts is unquantifiable. Its threat to the stifling power of fear is undetectable, safely stored in the hearts of those who are uplifted by it. We would do well to learn from the people of the world, the people of Iraq and the Afghan peace volunteers, who refuse to stop celebrating even in times of great duress, and bravely let their kites soar. 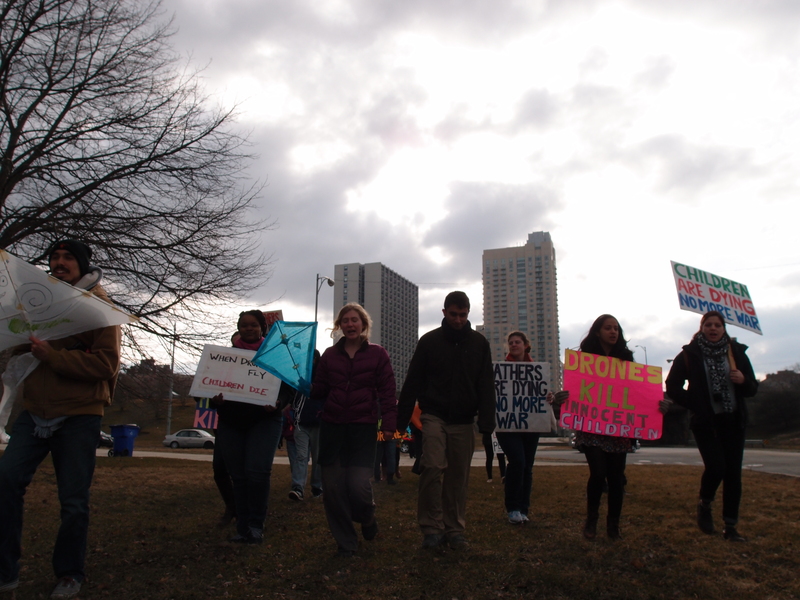 Organized by VNCV US, report by Sarah Stockdale. 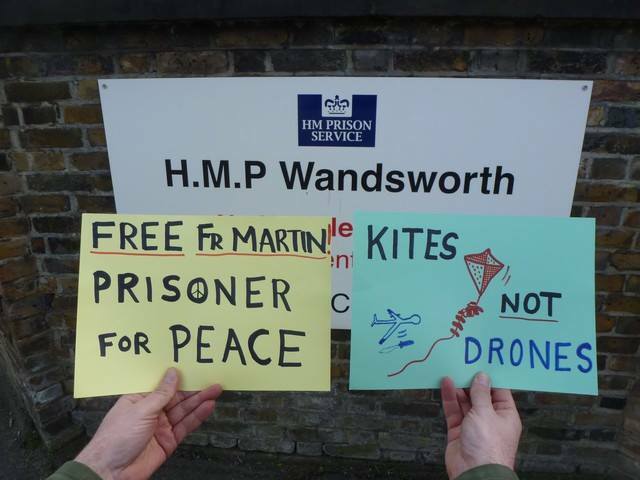 Fr Martin Newell (part of the Waddington 6) sends messages of support from HMP Wandsworth, he’s current imprisoned for non payment for 29 days for unpaid fines relating to protests against the Iraq & Afghan wars as well as Trident. 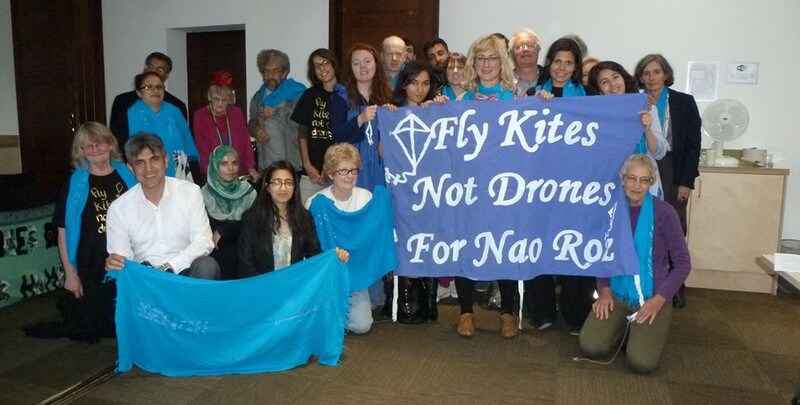 CARDIFF: Around 40 people gathered in central Cardiff in solidarity of those who have to live under the constant threat of drones. The action was organized by Palestine Solidarity Coalition and they made an outstanding short video (above) about their action. 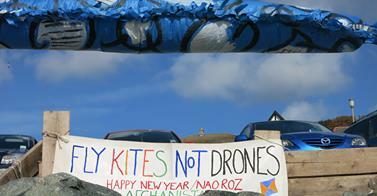 St Michael’s Mount: Banners and kites made by Wool not Weapons and a special Fly Kites Not Drones for Nao Roz art work was created. 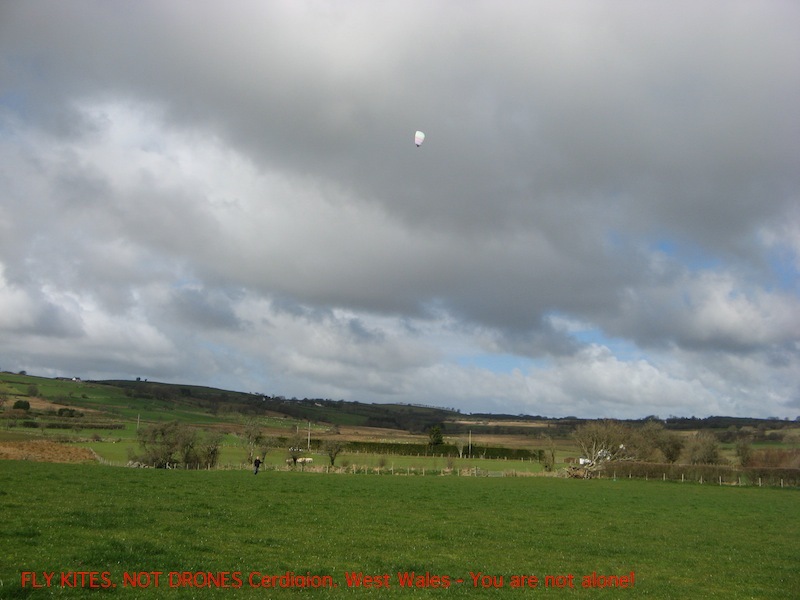 Over 30 people attended the event with fantastic Cornish flying conditions. 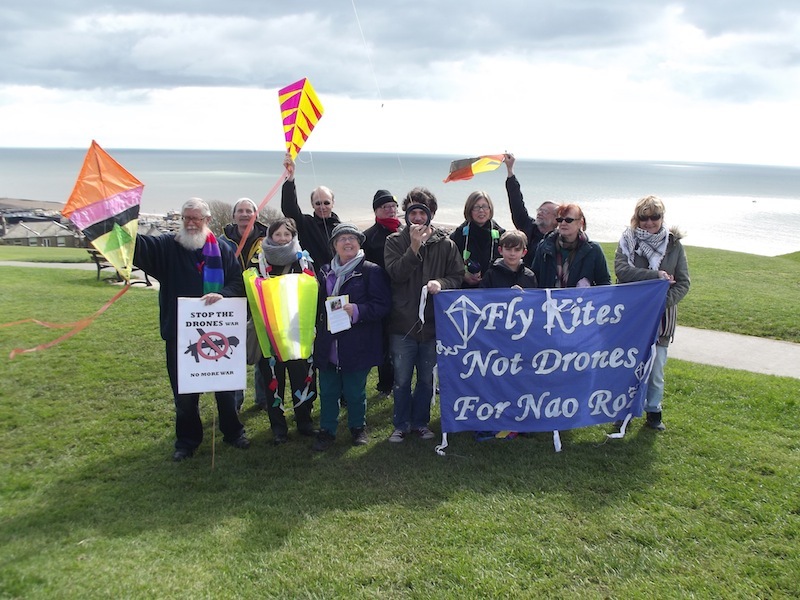 EDINBURGH: ‘Fly Kites Not Drones’ event on Saturday 22nd March proved to be a massive success for raising awareness about those living under the threat of drones. It was a fun-filled day that included: crafting and flying kites, face painting, storytelling, a live samba band and a dazzling fire display. 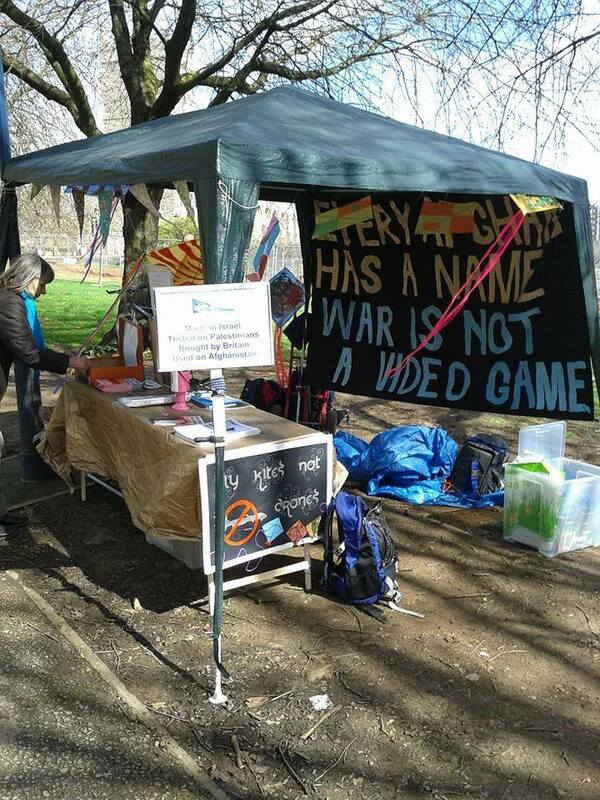 About 150 people including many families and children gathered in the Meadows to take part in ‘The Day of Action’ that was called for by Afghan Peace Volunteers and Voices for Creative Nonviolence UK. Fifty kites were made on the day and many people brought their own kites. It was one of several events around the UK that was campaigning for the abolition of drones. Significantly, this included a demonstration at RAF Waddington – the UK base from which Drones in Afghanistan are operated. Organized by the Edinburgh Peace & Justice Centre. 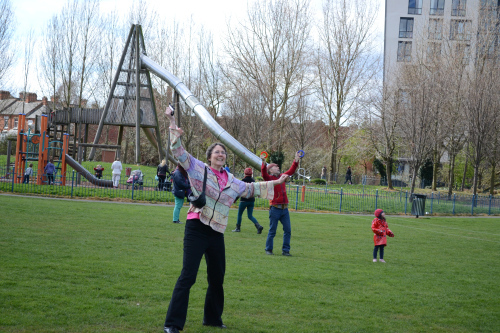 Leicester: flew kites on Saturday 22nd March as part of the Greenlight festival. 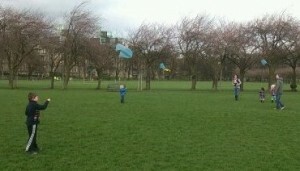 We gathered at the CND stall with a variety of hand made and bought kites and then went to nearby Bede Park. Local children joined in and we all had a great time. OTHER EVENTS: Norwich, Tavistock, Edinburgh, Leicester, Cardiff, Coventry, Oxford, Brighton, Blackheath, Burlington, Southampton, Rochester, Littlehampton, Taunton, Lewes, Bournemouth will be sending photos soon. SUPPORTERS of the event included: Drone Campaign Network, Network for Peace, Smash EDO, STW, CND, FoR, CAAT, plus the WikiLeaks Party and many more. TILONIA, India — A few months ago, the Afghan Peace Volunteers began planning to send a small delegation of young women to India as guests of Barefoot College, a renowned initiative that uses village wisdom, local knowledge and practical skills available in the rural areas to improve villagers’ lives. 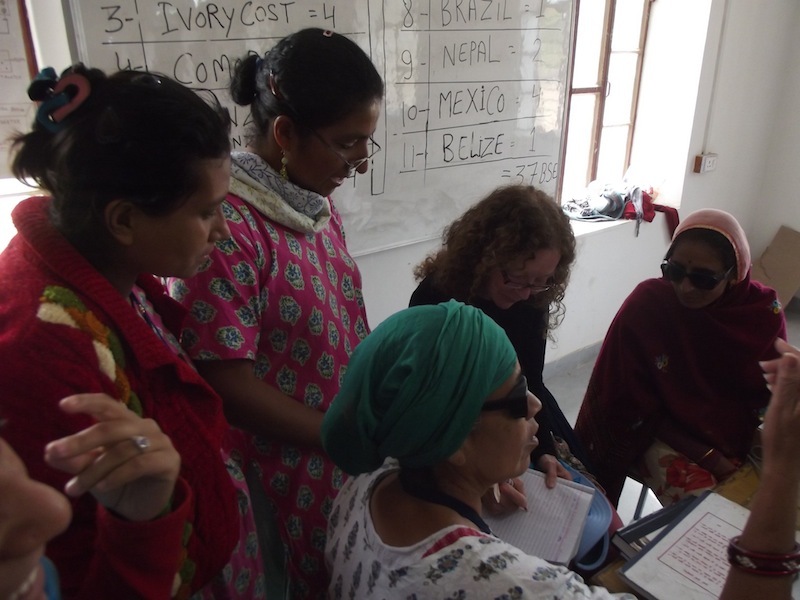 After several suspenseful weeks wondering if families and governments would give permission for travel, we were finally able to tell hosts at the Barefoot College that we would soon be on our way. Now we are beginning the last day of our brief but rewarding visit to Tilonia, the small village in India’s Rajasthan State, where two Barefoot College campuses are thriving. One of the villagers, Ram Niwas, has helped us learn about Barefoot College by telling us parts of his own life story and introducing us to people who have become barefoot dentists, accountants, solar engineers, radio broadcasters, teachers, water treatment specialists and puppeteers. Over the past 27 years, Ram Niwas has taken on many of these roles himself. As a ‘Dalit’, an ‘untouchable,’ he is not allowed to enter the local Hindu temple. But in his long association with Bunker Roy, a founder of Barefoot College, he has entered many places and gained experiences he never thought possible. “The caste system gave us 3,000 years of pain,” Ram Niwas told us. “But slowly, slowly, we are moving beyond it.” He then began to tell me about women who are still subjected to the manual labor of cleaning dry toilets. They load slop from the village latrines and toilets into jars which they then carry, on their heads, to a dumping ground outside the village. The job is as dangerous as it is demeaning. People who do this work suffer infections and other illnesses. From age 13 – 15, this was how Ram Niwas earned a living. Eventually, he heard about Barefoot College. Knowing that many Dalits worked there, he submitted an application. Bunker Roy asked if he could do accounting. 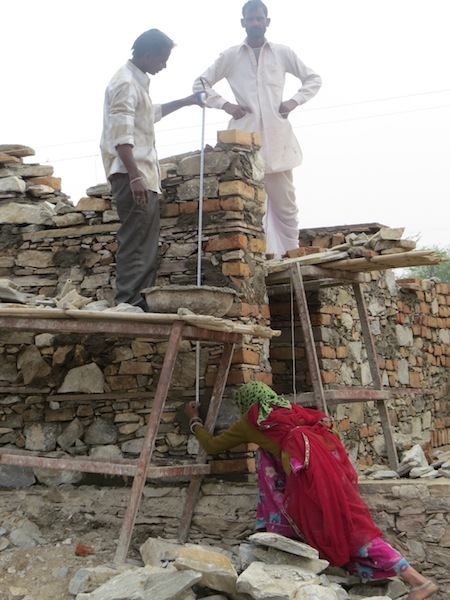 Ram Niwas assured him he couldn’t but that he would be willing to work as a peon. “We have no peons here,” Bunker said. “Just be sure to keep yourself honest, and try to learn accounting.” Ram Niwas had never seen 10,000 Rupees. He had no idea how to do basic math. But after a six month training, he became a capable accountant and a volunteer, working for a living wage, at Barefoot College. At first his family was unhappy because they felt he could make more money elsewhere. Over time, however, they realized that he had gained many experiences that aren’t directly linked to gaining money. He has become an artist, specializing in Puppet Theater. He also developed the Barefoot College community radio station. He has traveled beyond India and has participated in “yatras” in India, the long walks that campaign for fulfillment of basic human rights. 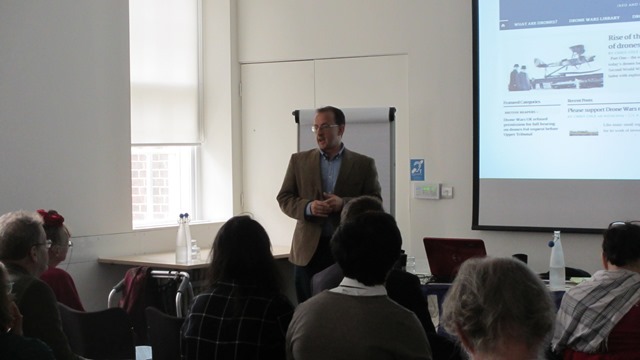 Now his work in communication includes many responsibilities, one of which is to help educate visitors like ourselves. We were grateful for his translation as he introduced us to various women. Jarina does much of the accounting for Barefoot College, using a computerized excel program. Battacharya is a “barefoot dentist” who can do many procedures as long as full anesthesia isn’t required. Bila decided to learn puppetry even though the caste system despises theater work as an activity relegated to members of the untouchable class. Bila is now an accomplished puppeteer, bringing delight to many audiences and also facilitating theater workshops. 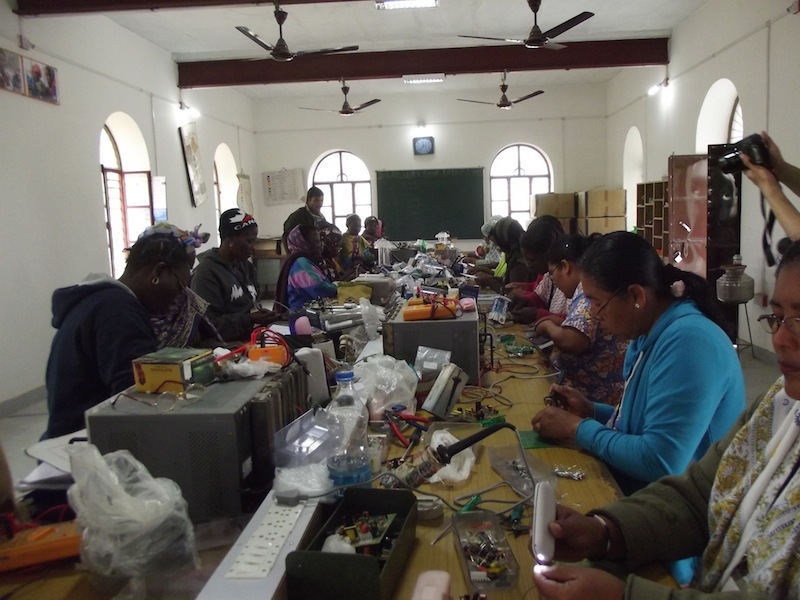 Raju organizes a solar energy shop, and Magankowar teaches women to assemble solar circuit boards. Yesterday, our delegation met with Bunker Roy. Zarghuna asked Bunker what motivated him to devote forty years of his life to creating the impressive campuses and projects that now constitute Barefoot College. Bunker Roy said that when he sees a grandmother who has lost all hope become, in six months, a gutsy and courageous woman who has learned how to be a solar engineer, he feels motivated to continue. When we had arrived, the first college members we met were a team of people mixing, shoveling and carrying cement for a new construction project. Most of the workers were grandmothers. Over the years, Barefoot College members have realized that young men who learn new skills often want a certificate which will enable them to take those skills elsewhere, giving them a chance to earn what Bunker calls a market wage. Grandmothers, on the other hand, have no intention of leaving their villages and families, yet they have enormous incentive to become skilled workers, improve their villages, and earn a living wage. Barefoot College welcomes them exuberantly. 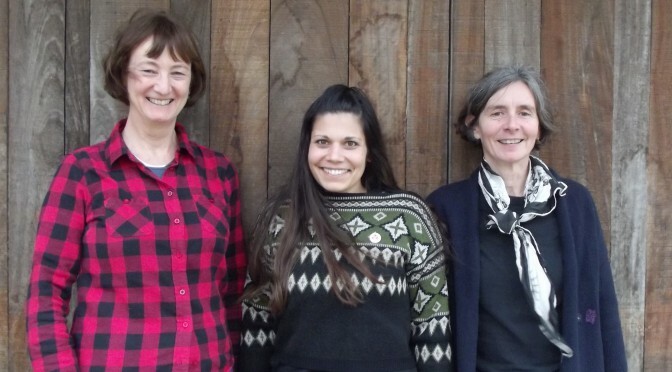 Now, village grandmothers are training women from other countries to follow similar paths. 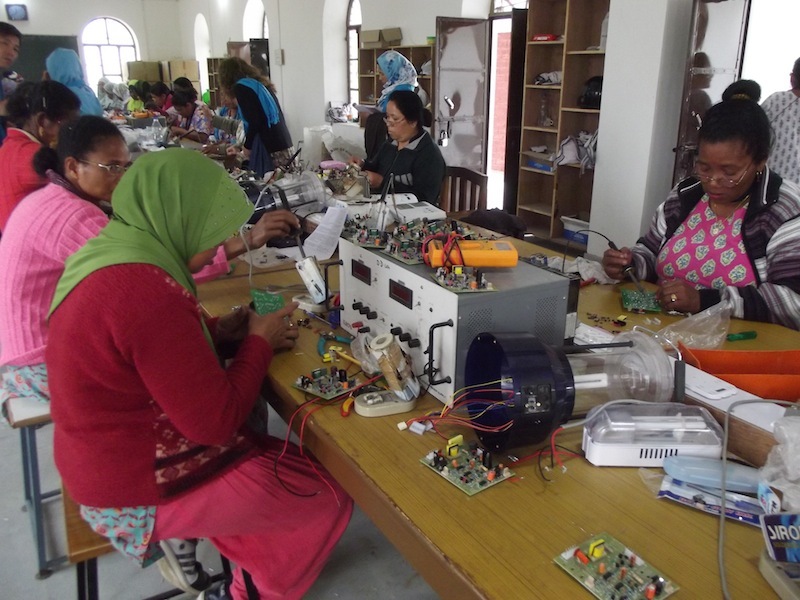 Ram Niwas took us to a large workshop where 37 women, all over 35 years of age, from 11 different countries were learning to become solar engineers. 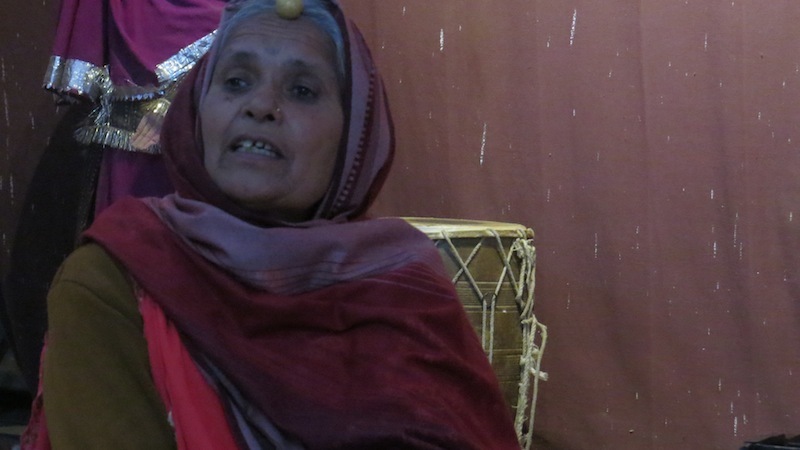 Magankowar has been using sign language to teach the women, all of whom are illiterate. 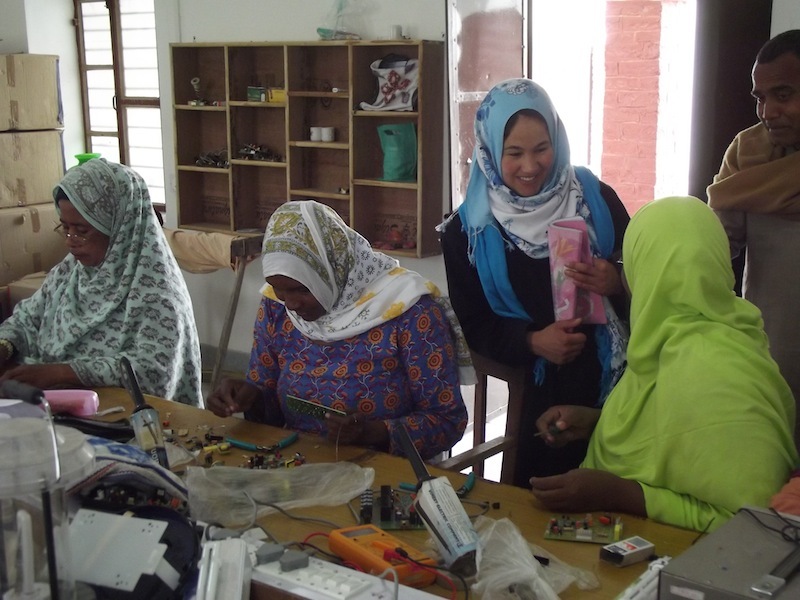 Seated at a long table covered with tools, circuit board components and colorful illustrated instruction manuals, the women worked with care and precision. Many had covered their heads with wooly hats or elaborate scarves from their own countries; almost all wore glasses, and many were dressed in the bright clothing typically worn by Indian village women. The young members of our team flew to India on an airliner. Nearly every aspect of modern travel awed them. But the common sense messages taught at Barefoot College, delivered amid a campus dedicated to simplicity, service, sharing of resources and a firm declaration of equality among all people, transported our young friends into yet another realm. “With simple resources available to all, the sun and the rain, we can create a world in which we free our potential,” said Zarghuna. “Or, we can artificially limit ourselves by fixing in our minds one way of doing things. It’s like locking our minds in a prison. If we open our minds, we can think of many possibilities. 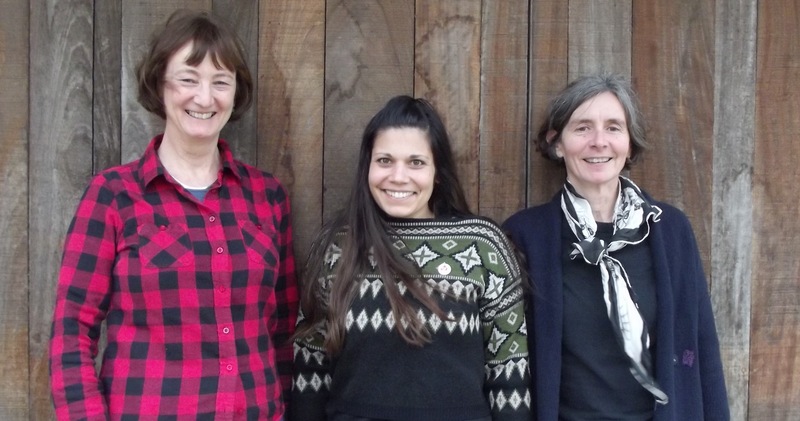 This year VCNV UK contributed £3,000 to the duvet project, most of those funds were raised by Mary Dobbing and Susan Clarkson who took collections after talks given to peace and Quaker groups. The APV’s projected budget was $30,000- which they have nearly reached, the bulk of the funds come from VCNV US, and Quakers in Australia. 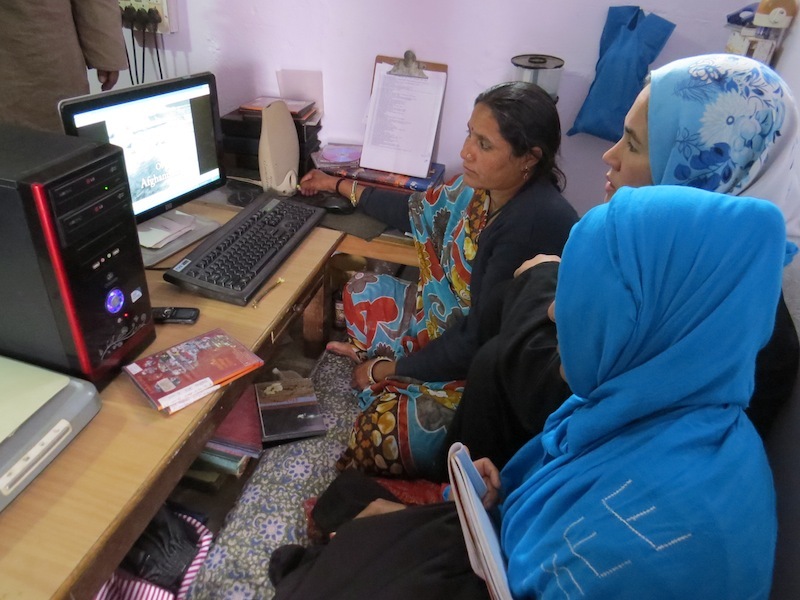 The project is run entirely by APV’s on a voluntary basis, the lead co-ordinator is 22 year old Khalida, other members of the co-ordinating group are Ali (aged 17), Marzia, Meena, Zainab and Zorah- all teenage women between the ages of 16 and 18. 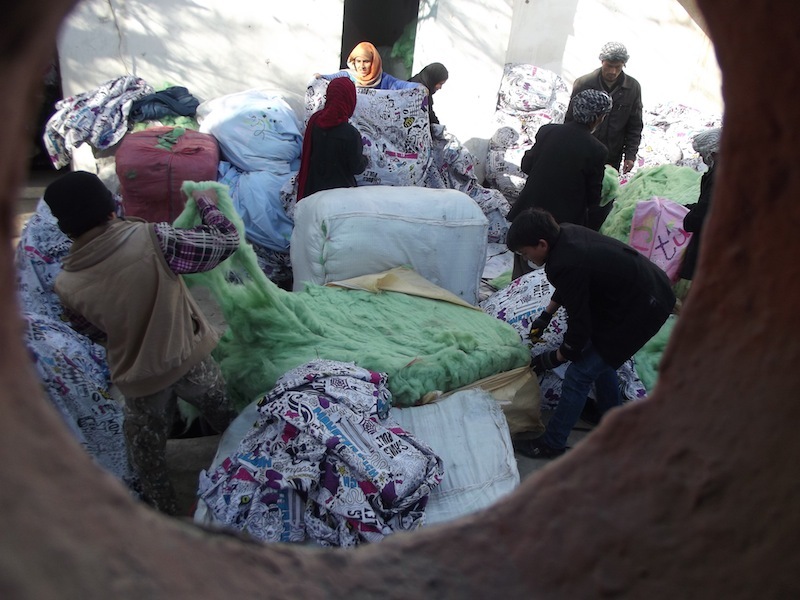 60 women are involved in the making of the duvets (20 from each ethnic group Tajik, Hazara, Pashtoon), the seamstresses are assessed at the beginning of the project to check they fulfil a criteria of being in need. There will be 4 rounds of duvet making and distributing, each woman makes 10 duvets per round, which means 2,400 duvets will be made and distributed within the 4 month project. Duvets are distributed to the very poor and in need, the APV select community leaders or organisers who draw up a list of needy individuals in their area. 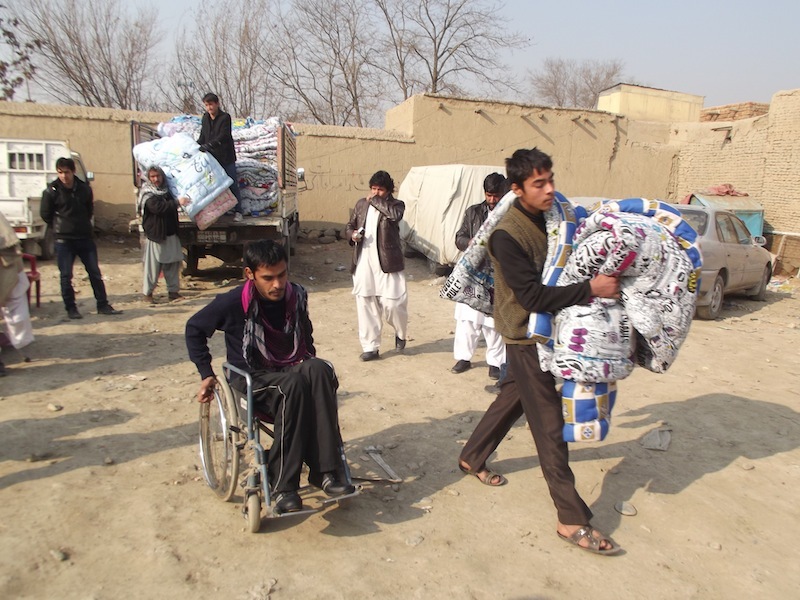 Distributions have been at: refugee camps, a school for the blind, a number of mosques, Bobor gardens and disabled groups including the Afghan Landmine Survivors Organization. 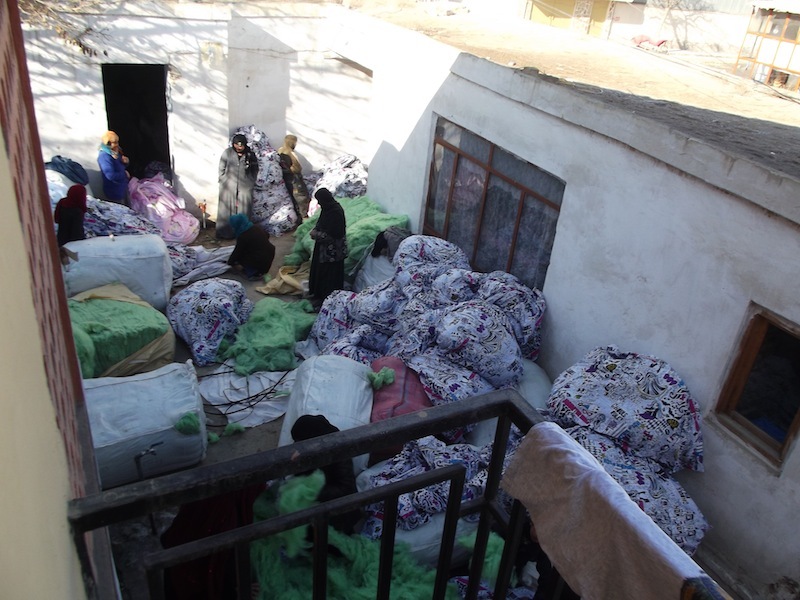 Between 120-200 duvets are loaded up into a truck for each distribution run. At a distribution point each recipient (usually a woman) receives 2 duvets, their name is ticked off a list while they hand in an APV receipt. Khalida Co-ordinator of the project, age 23 This is Khalida’s first job, she’s semi literate and really happy to be working on the project. Her role is as the overall co-ordinator, she works as a volunteer and her responsibilities include purchasing the materials, distributing them to the seamstresses, assessing seamstresses using an eligibility criteria, paying wages to the seamstresses and organising the distribution teams. Her family members support of her work. Shakila age 14, Co-ordinators assistant – She says she does the job because it helps the poor by helping their daily needs. When they visit the homes of seamstresses some of the ladies don’t even have carpets so they lay cloth on the floor to sleep on. 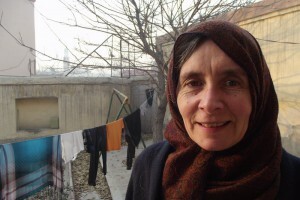 Freyba Her husband was killed around 3 years ago during a suicide bombing at a Shia Hazara Mosque in Kabul. She says in place of unemployment this is a good project, she was hoping for something more on a long term basis but the money she receives is helpful for buying coal and flour. Nafaz Gul Her husband was sent to prison for 15 years over a land dispute, he was also a drug user which perhaps contributed to his imprisonment, she is alone at home bringing up 4 children. Nafaz says what she gets from the duvet making helps to buy salt, oil and flour for her family, she is grateful that she is able to receive materials to sow. Zorah Her body aches all over constantly and she usually feels tired. She was widowed during the communist period, for ages she struggled to get ID papers from her home province, this is required in order to receive an annual allowance from the Department of Martyrs. Zorah wants to get on the duvet project as a seamstress. Soraya She was widowed last year when there was a mini bus attack by a suicide bomber, her husband was on the bus. She is now bringing up 5 children alone. As well as making duvets she also washes clothes and cleans in people’s homes. She says that when the project ends she hope another one will start so she can continue to earn money. The project is good for her as she prefers to work from home. She is keen to receive duvets as well. Nassima Her husband works as a labourer, she has 4 children. She says the project is some help but hopes work will continue. Problems within the project A few of the seamstresses commented that transport costs are a bit of a problem for women who live far away. 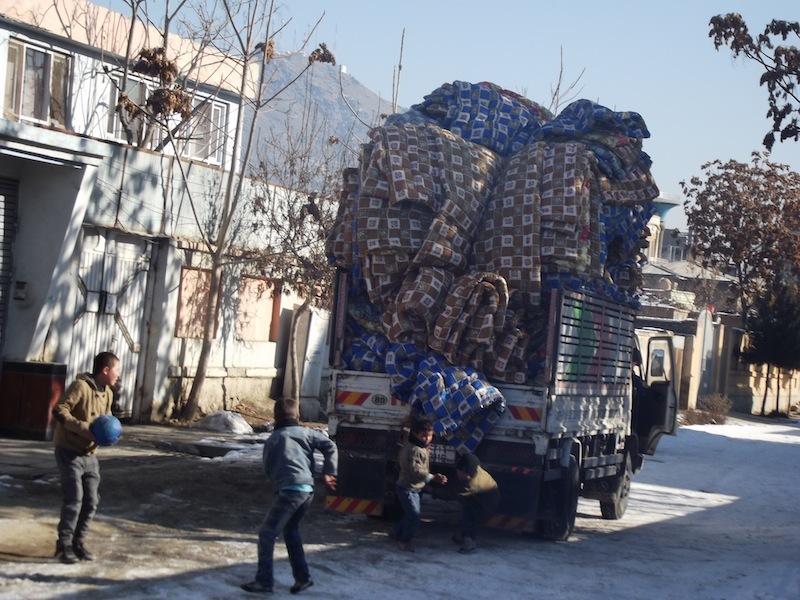 A taxi to transport the materials home and then the duvets back can be around 800 Afghanis, this is over half the amount (1500 Afghani’s) they receive in wages per duvet batch. Ali (a coordinator of the project) explained that when they selected the women they had a set budget which didn’t include transport costs. He also pointed out that if they started giving subsidies to women who live far away then all the women should receive something for travel, then there might be accusation that the group had extra funds all along which they were keeping (apparently a common practice with NGOs). Also the issue of whether they refund past travel expenses. We came up with the proposal for Ali to work out an estimation of how much a travel subsidy would cost, we would then try to raise funds to provide a grant, we hope for all the women. Najeeba has four children, one son and three daughters aged 2-14. Sat in the pale sunlight of a cold January morning, she tells me that the duvets she will receive from the APV will be of vital help: “This is a very good thing, there are a lot of poor people in this area”. 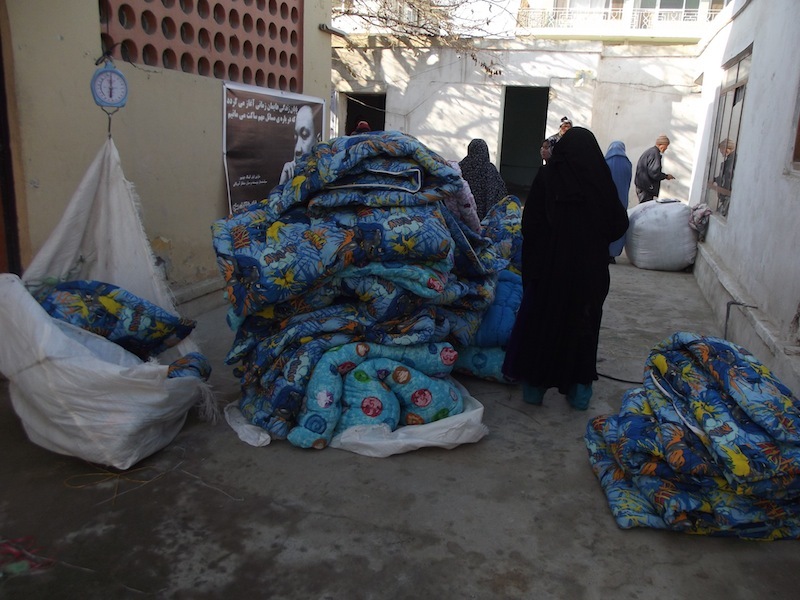 We’re in District Five, at the foot of a mountain, in the courtyard of a mosque filled with women in burkas waiting to collect their two puffy, warming duvets, made by women from backgrounds as impoverished as theirs. 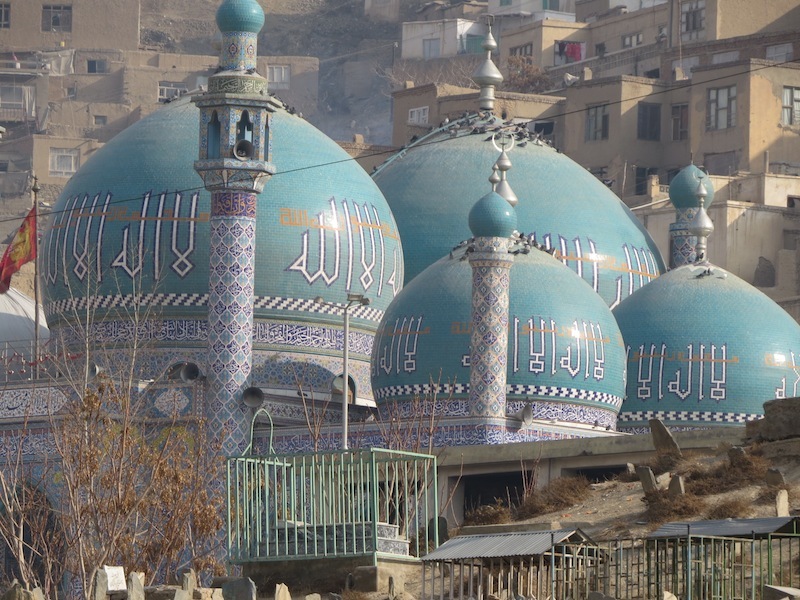 A cemetery of basic, barely marked graves on uneven ground is just beyond us, and in the distance, a stunningly beautiful blue domed mosque catches the light before giving way to hundreds of homes built into the rock of the mountain. It’s a beautiful sight. I ask Najeeba whether her husband works. “My husband pushes a cart for a living, he carries things for other people – rice and oil, to the market. He earns 150 Afghani or just 50 per day, it depends on who hires him”. 150 Afghani is about £1.50. “I also taking on some needle work from shops which I can sew at home in between looking after my children. I sew scarves and dresses. 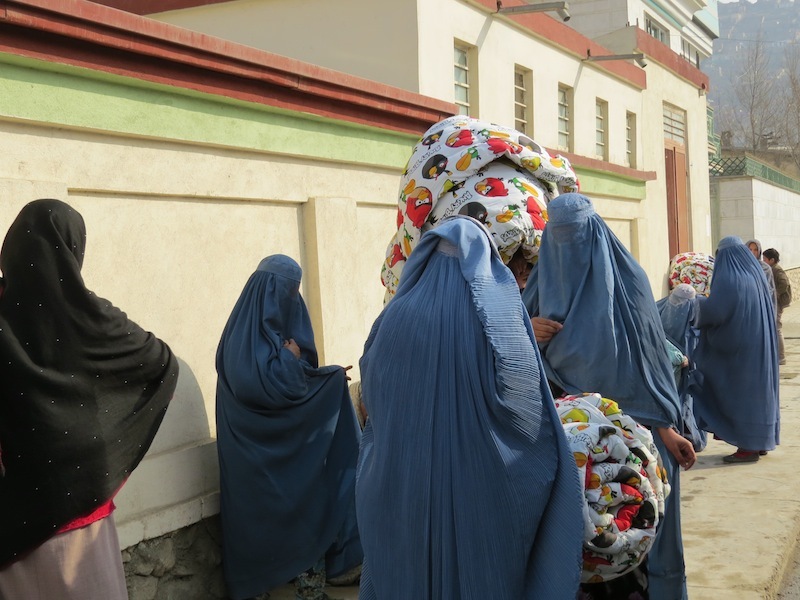 For embroidering a dress, which can take me two months, I get 2000 Afghani (£20) This involves very hard, detailed work. I sew after I have finished the housework of cleaning and sweeping. I spend three hours a day sewing”. “Many women are in the same situation as me. I have a lot of hopes for the future though. I hope we can afford to buy our own house and that my husband will find a better job”. 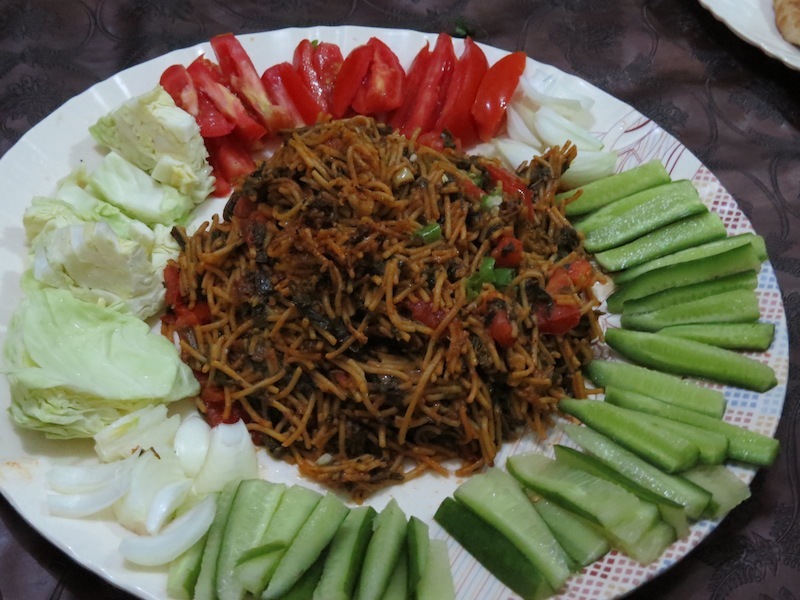 Najeeba lives in a simple two room house with no kitchen. They cook their meals and make tea on a simple stove. 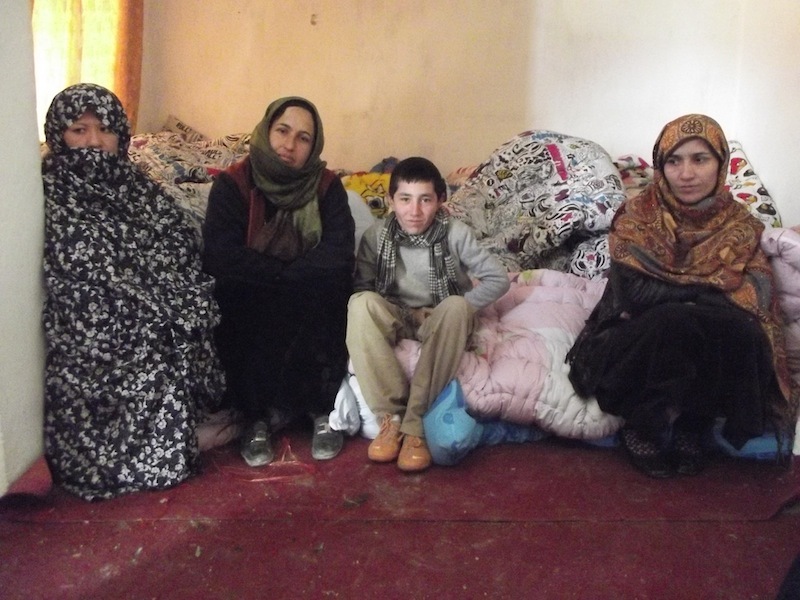 The rent sets them back 3000 Afghani a month – a large part of her and her husband’s joint income. 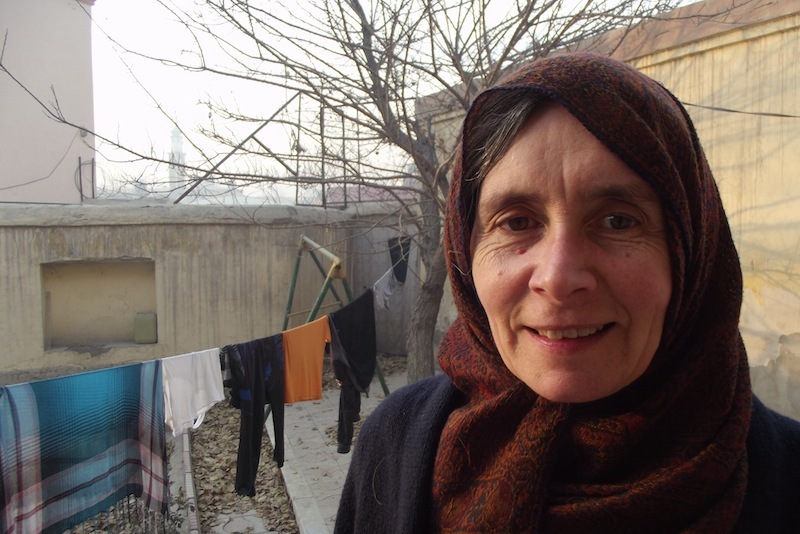 “I have high hopes for my children, that they will study and get a good education. Both myself and my husband are illiterate but I hope also to study. Simple things, like understanding phone numbers and names”. I ask her what she feels about the forthcoming elections? “I still have hope. I will vote this year. I believe change will come”. This month, from Atlanta, GA, the King Center announced its “Choose Nonviolence” campaign, a call on people to incorporate the symbolism of bell-ringing into their Martin Luther King Holiday observance, as a means of showing their commitment to Dr. King’s value of nonviolence in resolving terrible issues of inequality, discrimination and poverty here at home. The call was heard in Kabul, Afghanistan. 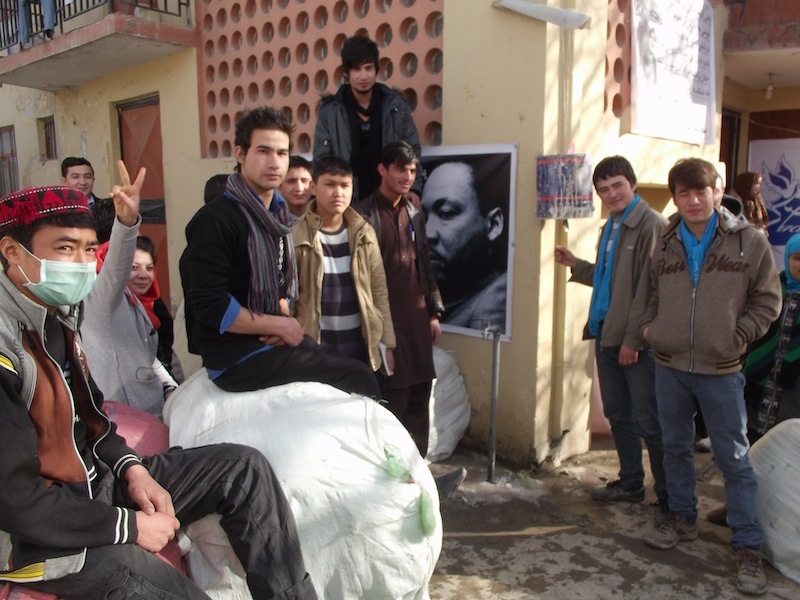 On the same day they learned of the King Center’s call, the young members of the Afghan Peace Volunteers, in a home I was sharing with them in Kabul, were grieving the fresh news of seven Afghan children and their mother, killed in the night during a U.S. aerial attack – part of a battle in the Siahgird district of the Parwan province. The outrage, grief, loss and pain felt in Siahgird were echoed, horribly, in other parts of Afghanistan during a very violent week. My young friends, ever inspired by Dr. King’s message, prepared a Dr. King Day observance as they shared bread and tea for breakfast. They talked about the futility of war and the predictable cycles of revenge that are caused every time someone is killed. Then they made a poster listing each of the killings they had learned of in the previous seven days. They didn’t have a bell, and they didn’t have the money to buy one. So Zekerullah set to work with a bucket, a spoon and a rope, and made something approximating a bell. 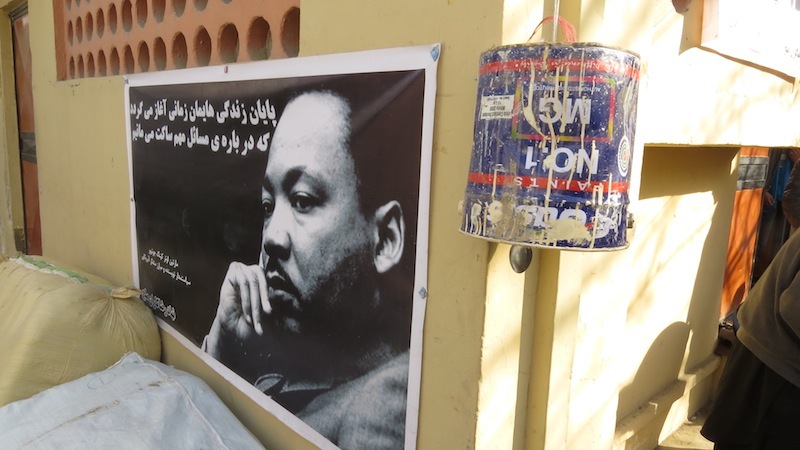 In the APV courtyard, an enlarged vinyl poster of Dr. King covers half of one wall, opposite another poster of Gandhi and Khan Abdul Gaffir Khan, the “Muslim Gandhi” who led Pathan tribes in the nonviolent Khudai Khidmatgar colonial independence movement to resist the British Empire. Zekerullah’s makeshift “bell’ was suspended next to King’s poster. Several dozen friends joined the APVs as we listened to rattles rather than pealing bells. The poster listing the week’s death toll was held aloft and read aloud. 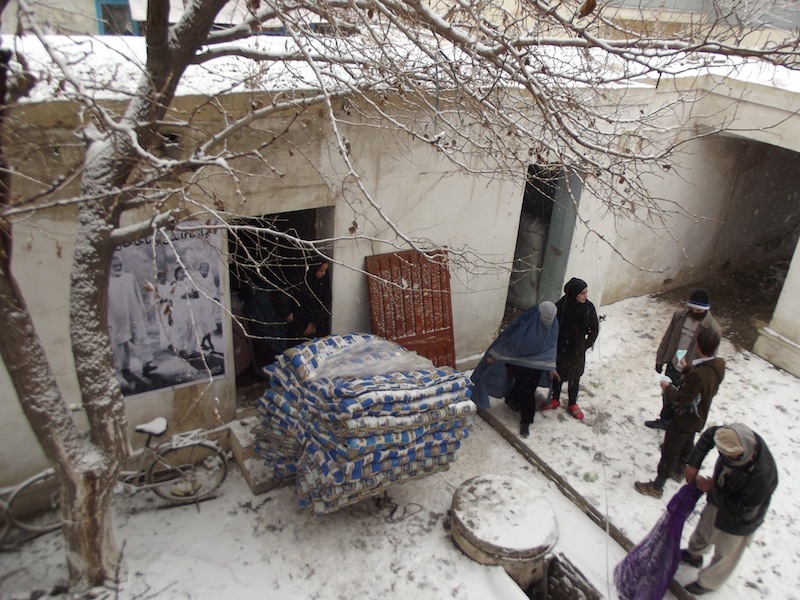 We couldn’t know, then, that within two days news would come, with a Taliban announcement claiming responsibility, of 21 people, 13 foreigners and eight Afghans, killed while dining in, or guarding, a Kabul restaurant. The Taliban said that the attack was in retaliation for the seven children killed in the airstrike in Parwan. Week after bloody week, the chart of killings lengthens. 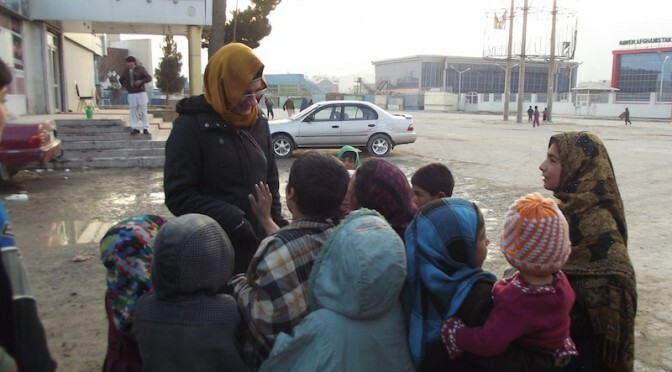 And in Afghanistan, while war rages, a million children are estimated to suffer from acute malnourishment as the country faces a worsening hunger crisis. … A true revolution of values will soon look uneasily on the glaring contrast of poverty and wealth. With righteous indignation, it will look across the seas and see individual capitalists of the West investing huge sums of money in Asia, Africa, and South America, only to take the profits out with no concern for the social betterment of the countries, and say, “This is not just.”… The Western arrogance of feeling that it has everything to teach others and nothing to learn from them is not just. A true revolution of values will lay hand on the world order and say of war, “This way of settling differences is not just.” This business of burning human beings with napalm, of filling our nation’s homes with orphans and widows, of injecting poisonous drugs of hate into the veins of peoples normally humane, of sending men home from dark and bloody battlefields physically handicapped and psychologically deranged, cannot be reconciled with wisdom, justice, and love. A nation that continues year after year to spend more money on military defense than on programs of social uplift is approaching spiritual death. We must never forget the full range of Dr. King’s vision, nor the full tragedy of the world he sought to heal, nor the revolutionary spirit which he saw as our only hope of achieving his vision – making do with everything we have to try to keep freedom ringing, despite the pervasiveness of the evils that beset us, and a world that needs vigorous effort to save it from addictions to tyranny and violence practiced by reckless elites. 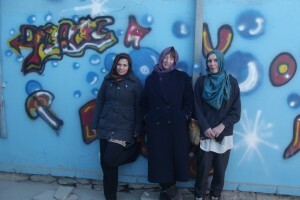 I’ve been in Kabul a week now, living in the Afghan Youth Peace Volunteer (APV) house on the border of District 3. The area is a mish-mash of wealthy mirror-windowed mansions fronted by surly gun-on-the-lap security guards, crumbling mudhuts, open sewers, children in ragged clothes warming themselves on burning rubbish, a fake McDonalds and Subway with directly lifted logos, and Kabul’s sole waterpark, for men only and 500 Afghanis a dip. 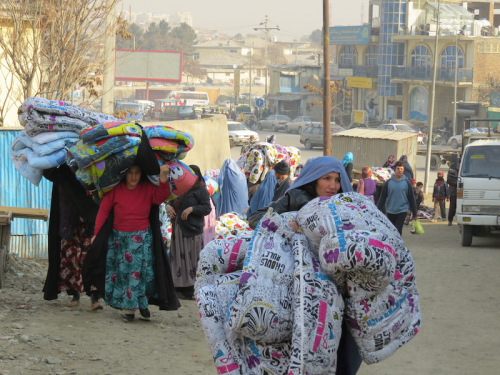 One disc of naan bread is 10 Afghanis (around 10p) and the women working on the APV’s duvet-making project get 150 Afghani’s per duvet, a two hour job, and make 3 per day, earning £4.50 per day in total – a relatively decent wage compared to most people in the precarious work sector who earn between $1-5 per day. Men wait for work on the ‘Red Bridge’, a 10 minute walk from us. 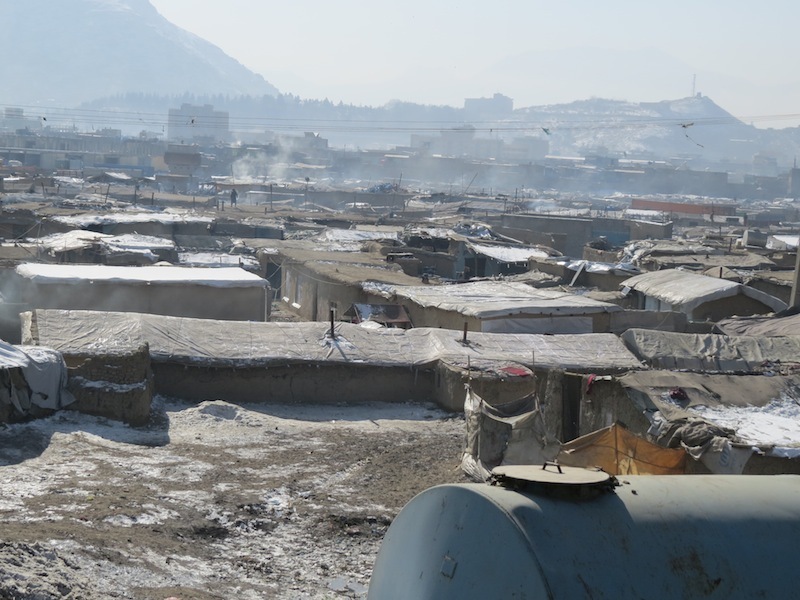 It crosses the Kabul River, once free flowing but now a stagnant mud swamp, flanked with bags of rotting rubbish and opium addicts crouching in the shallows. Child workers take their breaks in chip shops and at Bolani stands (Bolani is a deep fried pastry filled with potato, green chilies and squash) swaggery and manly like mini 40-year-olds. Everything feels on the brink here. The unemployment rate (stats apply to men only) is officially 30% but unofficially twice as high. Most work is precarious: street vending, cart pushing, tailoring and shop work – the main ones seem to cater for just-in-time-survival – car spare parts, all manner of appliance and home repairs and replacements, wood for home heating by stove, food, and gas sold not by the canister but by the kilogram. Catering for 10 (the number in our ‘family’ right now) involving boiling tea to have with all meals and a few times between for guests plus a hot lunch and dinner of simple rice and beans or okra or fried eggs, amounts to 15kg or 4 cannisters amoutning to 1200 Afghanis or £12.92 per month. Many families can’t count on a regular income and there’s no system of social security from the government despite the $100 billion given by the USA and the £37 billion by the UK for ‘reconstruction’ pumped into the country since 2001. 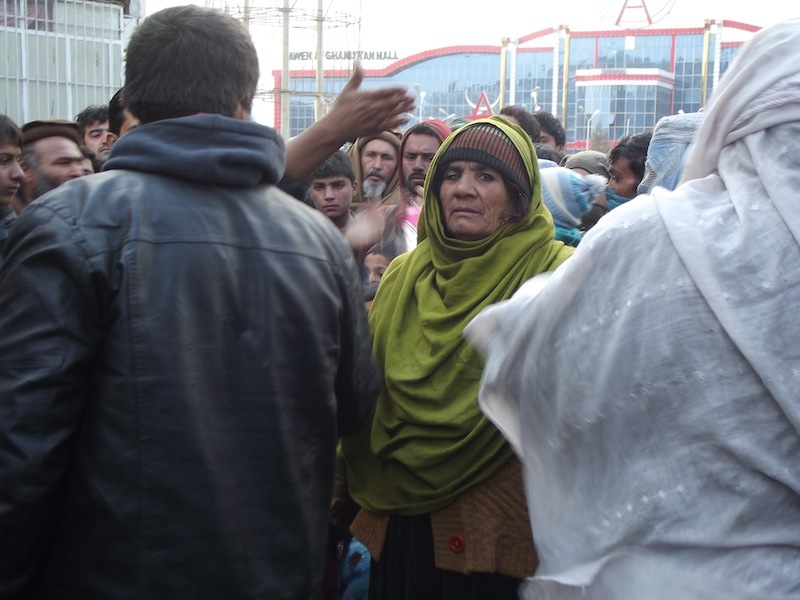 Aid drops – I’ve been to four so far – can turn desperate and hectic with those not registered with APV or refugee camp authorities being turned away empty outstretched-handed. At a recent drop in Charman-e-Hozuri, by Voices for Creative Non Violence we met camp elders, who uniquely for Afghanistan, were women. Strong, commanding, faces uncovered, and steely eyed, they shouted into a crowd slipping and clamouring in ice and mud to get hold of 500 tins of high quality cooking oil being doled out at one per family. The women stood between armed police and the crowd, gesticulating assertively and shouting orders to the men around them. The police facilitated the drop, even facilitating themselves to 3 canisters of the oil. Corruption, militarised and violent, is rife here. Police real wages seem to be bribes. 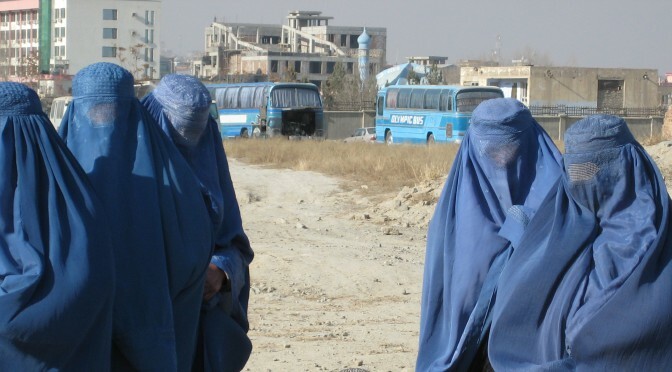 Afghanistan ranks as the third most corrupt country in the world after Somalia and North Korea. arkness, struggling to top-up and when they can’t, being regularly plunged into the cold and dark because of poverty and profiteering companies. Here we’re cut off every other day and the freezing, dank, dusty cold envelopes everything. 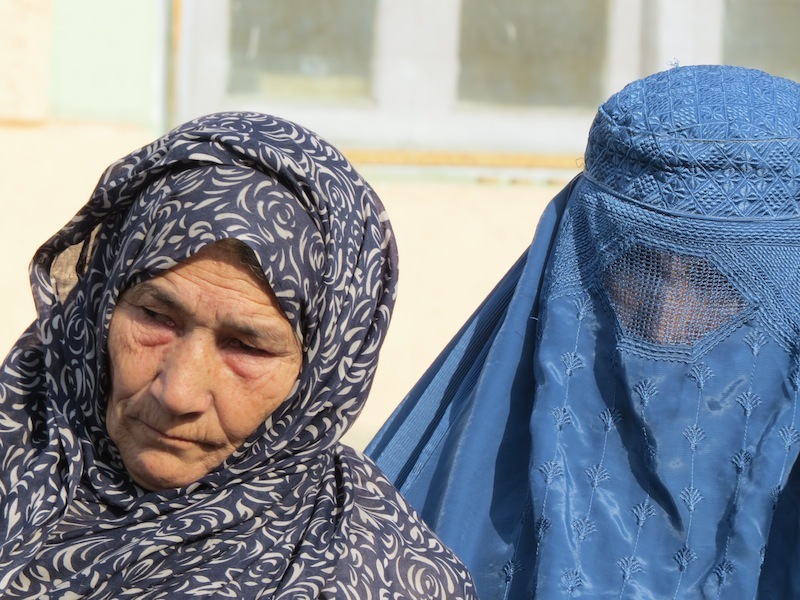 Afghan women committed suicide in 2012. 60% of the population is under 25 and 60% of children are malnourished. Accessible free education is a thing of the distant past. State schools are few and far between with many teachers having left the country. If they can afford it, parents put their children through private schools but most can’t. Religious schools and further education can still be found for free but the education is narrow in its’ scope. 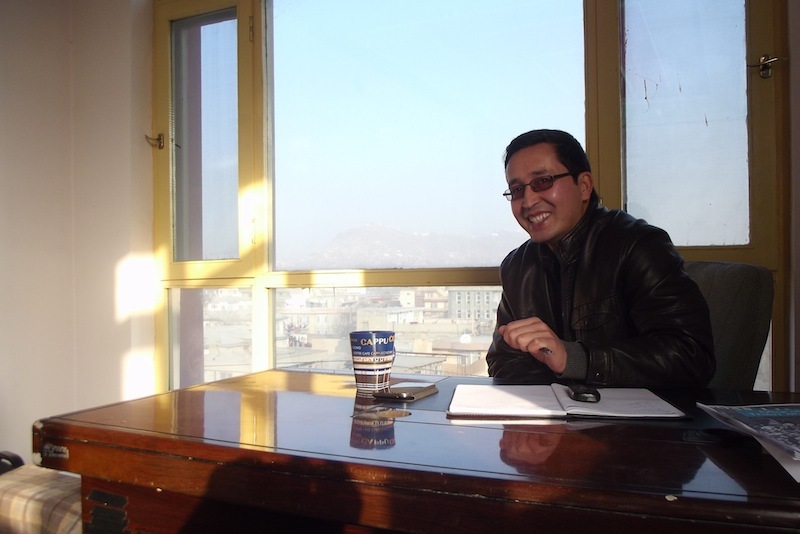 Universities charge on average 50,000 Afghanis ($1000) per year of study. I met one Economics student from Kandahar who said he wasn’t really learning anything at University. They lacked books, good teachers, materials and up-to-date information in Dari. NGOs and Aid are big business, grooming an English-speaking elite, many of whom squat the upper rungs of the socio-economic ladder before making a break for the ultimate destination; up and out of the country. If this sounds dystopian, it’s because it is. 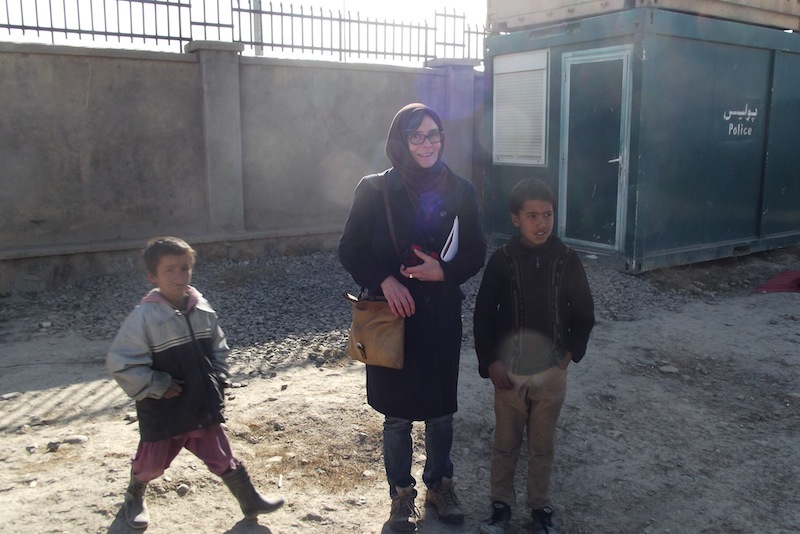 But there are also a sizeable number of Afghan men, women and youth working to challenge corruption, the class system, sectarianism, misogyny and violence in all its’ forms. The APV is one such rare group. 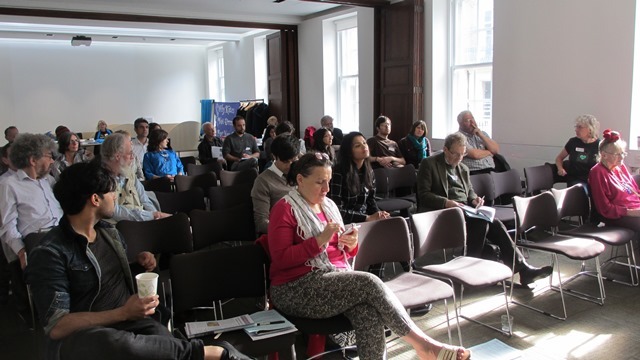 Totally grassroots and funded by likeminded grassroots peace groups from all over the world, it is independent of political parties and radical in its’ commitment to building safer spaces and anti-oppression in action. They carry a vision of a borderless world where war and economic, social, cultural and political violence can be abolished. A guiding philosophy is that the means by which we organise have to reflect the ends we want to see. 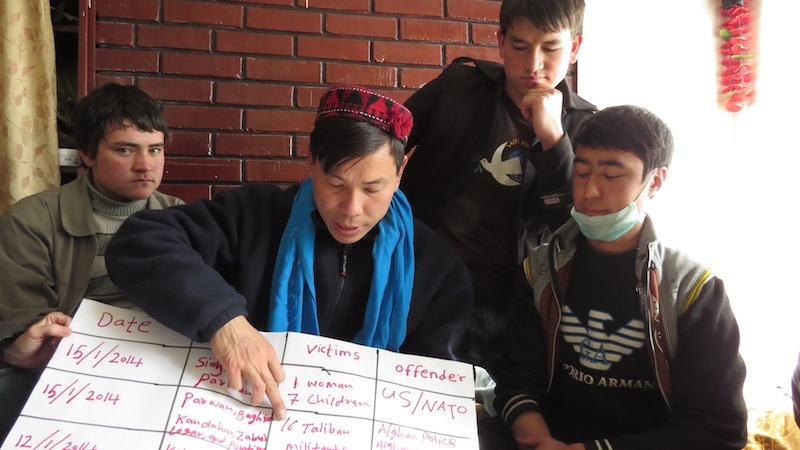 They’re walking the talk and have been building integrity and trust since they emerged from Bamiyan six years ago, as a small group of Hazara youth taught by Singaporean Doctor Hakim (Wi Tek Young) gone native after 10 years in the country. They’re now composed of Hazara, Pashtun and Tajik community members and are looking for Uzbek participants in order to create the lived conditions for co-existence and co-operation between ethnic identities in a country where mixing between different groups is rare and sectarian violence and prejudice are rife. The APV are hugely inspiring, and the work they do, the journeys they have been on and who they are reclaims, re-generates and re-defines the much abused, co-opted and discredited concept of ‘peace’ in a country where war has been the dominant language for decades. To respond to dystopia with an active creation of a utopia is a huge act of rebellion and one that we can all learn from as the world we live in becomes more and more oppressive. From Kabul to England, from the war we’ve exported to the ongoing class war at home – here are seeds for change that can go global.